本发明提供了包含有益剂递送颗粒的组合物，所述有益剂递送颗粒包含右旋糖酐作为递送助剂。 The present invention provides a composition comprising a benefit agent delivery particle, said benefit agent delivery particle comprising a dextran as a delivery aid. 所述有益剂递送颗粒还可以包含非多糖聚合物，优选氨基塑料聚合物。 The benefit agent delivery particle may further comprise a non-polysaccharide polymer, preferably an aminoplast polymer. 所述有益剂递送颗粒可以包含香料。 The benefit agent delivery particle may comprise a perfume. 本发明还提供了所述颗粒的制造方法，其中利用乳液聚合包封芳香油以形成核-壳颗粒，（在可替代方案中所述香料可以后来吸附），并在所述递送助剂存在下在所述核壳颗粒的外表面上形成进一步的聚合物层。 The present invention also provides a method for producing the particle, wherein the perfume oil encapsulated by emulsion polymerization to form a core - shell particles (in an alternative embodiment the perfume may be adsorbed later), and the delivery of the auxiliaries a further polymer layer is formed on the outer surface of the core-shell particles. 本发明涉及表面处理组合物，并且更具体地涉及包含颗粒的组合物，所述颗粒包含有益剂(优先是香料)和沉积助剂。  The present invention relates to a surface treatment composition, and more particularly relates to a composition comprising particles, said particles comprising benefit agent (perfume priority) and the deposition aid. 本发明还涉及将所述有益剂(优选香料)例如在洗涤期间递送到织物、或递送到人体基体表面例如皮肤或更优选头发上。 The present invention further relates to the benefit agent (preferably perfume), for example, delivered to the fabric during a washing, or delivered to the body surface of the base on the skin or hair, for example, more preferably. 本发明将特别参照香料作为有益剂进行描述，但认为本技术适用于其它用于表面处理过程的有益剂。  The present invention will be particularly useful as a fragrance agent, reference will be described, it is believed that the present technique is applicable to other beneficial agents used for the surface treatment process. 在洗衣应用中，例如，在织物处理如织物的洗涤和整理期间会用到香料的沉积。  In laundry applications, e.g., during a fabric treatment such as washing and finishing fabric perfume deposition will be used. 沉积方法多种多样，包括在洗衣过程的洗涤或漂洗阶段进行沉积，或者在洗涤之前或之后进行直接沉积，如通过喷洒或者抓揉或者在甩干期间使用浸渍片或者蒸汽熨烫时使用水添加剂。 Variety of deposition methods, including washing or rinsing stage in a washing process of deposition, or by direct deposition before or after washing, using water as an additive by spraying or dipping or rubbing grip sheet during spinning or steam ironing . 香料通常被包含于载体或者递送系统中。 Perfume is usually included within a vector or delivery system. 香料载体系统通常基于将香料包封或捕获在基质内。 The carrier systems are generally based perfume fragrance encapsulated or captured within the matrix. 沉积到表面后，存在的一个问题是香料粘附至这些表面上的寿命在含有表面活性剂的情况下本身是很低的。 After the  deposited onto the surface, a problem of the life of the perfume adhered to these surfaces in the case of containing a surfactant itself is very low. 已沉积到织物上的香料可能在主洗的过程中又被洗掉，或者香料可能从其载体中被浸出到洗涤液中。 Perfume has been deposited onto the fabric and may be washed away during the main wash or fragrance can be leached into the wash liquor from the carrier. 因此，在香料沉积到表面之前和之后，对其进行保护是必需的。 Accordingly, the perfume deposited onto the surface before and after its protection is required. 其它有益剂会遇到类似的问题，其如香料一样，通常比较昂贵并且在洗衣组合物中以相对低的水平存在。 Other beneficial agents experience similar problems, which as such as fragrances, are generally expensive and relatively low levels in the present laundry compositions. 类似的问题也出现在皮肤和头发处理领域，在所述领域中香料和/或其它有益剂要沉积在皮肤或头发上。  Similar problems arise in the field of skin treatment and hair, in the field of fragrances and / or other beneficial agent to be deposited on the skin or hair. W007/62833涉及包含核-壳包封的香料颗粒的组合物，所述颗粒以多糖(其是纤维素亲和性的）修饰。  W007 / 62833 relates to a core - shell composition encapsulated perfume particles of the polysaccharide particles (which is a cellulose affinity) modifications. 其中公开的多糖优选是刺槐豆胶、罗望子木葡聚糖、瓜儿胶或者它们的混合物。 It disclosed wherein the polysaccharide is preferably locust bean gum, tamarind xyloglucan, guar gum or mixtures thereof children. 因此，使颗粒含有有益剂(香料)是已知的，所述颗粒使用纤维素亲和性的多糖作为递送助剂，以促进颗粒对特定底物的结合。 Thus, the particles comprising benefit agent (perfume) are known, the affinity of the cellulose polysaccharide particles used as a delivery aid to facilitate binding particles to a particular substrate. 所述组合物也可以含有一种或者多种酶。 The composition may also contain one or more enzymes. 在参考文献中公开的适用的酶，包括例如那些被称为纤维素酶的酶。 Disclosed in the reference of suitable enzymes include for example, those referred to cellulase enzymes. 术语纤维素酶指对多种底物表现出一系列可能反应的一类酶。  The term cellulase refers to a variety of substrates class of enzymes exhibiting a range of possible reactions. 纤维素亲和性的多糖的一个问题是，他们具有通常与纤维素相似的结构，并且因此，他们易被"纤维素酶"攻击。 One problem affinity for cellulose polysaccharides is that they have a generally similar structure to cellulose, and therefore, they are susceptible to "cellulase" attack. 对于聚酯已经提出了类似的有益剂递送助剂，所述聚酯基于类似于所谓的污物释放聚合物的含邻苯二甲酸酯的聚合物。  The polyesters have been proposed for a similar beneficial agent delivery aid, said polymeric phthalate based polyester similar to a so-called release polymer containing dirt. 这些邻苯二甲酸酯聚合物具有水解的问题并且对棉不亲和。 These problems phthalate polymer having hydrolysis and cotton incompatibility. 许多文献公开了纤维素类材料还可以起到污物释放聚合物和抗再沉积剂的作用。  Many documents disclose cellulosic material may also function as polymeric soil release and anti-redeposition agent. 美国专利N〇.2,373,863，Vitalis(1945)中公开了在洗涤剂组合物中使用甲基和乙基纤维素醚。 U.S. Patent No. N〇.2,373,863, Vitalis (1945) disclose the use of methyl cellulose and ethyl ether in the detergent composition. Reich等的美国专利No. 2,994,665(1961)公开了用于洗涤剂中的许多纤维素;也参见Dean等的美国专利No.3,523,088(1970) Jan der Werth于1956年11月2日的德国专利No. 1，054,638公开了C12烷基苯磺酸盐与羧化纤维素衍生物相结合。 Reich et al, US Patent No. 2,994,665 (1961) discloses a number of cellulose used in detergents; see also Dean et al., US Patent No.3,523,088 (1970) Jan der Werth on November 2, 1956 German Patent No . 1,054,638 discloses a C12 alkylbenzene sulfonates in combination with carboxylated cellulose derivative. 英国专利No. 1，084， 061公开了少量的纤维素作为液体洗涤剂的稳定剂。 British Patent No. 1,084, 061 discloses a small amount of liquid detergent cellulose as a stabilizer. 英国专利No. 927，542、765，811和340， 232也教导了洗涤剂中的纤维素。 British Patent No. 927,542,765,811 and 340, 232 also teaches the cellulose detergents. US4174305公开了含有纤维素醚污物释放剂的烷基苯磺酸盐洗涤剂组合物。  US4174305 discloses a detergent composition comprising alkyl benzene sulfonates cellulose ether soil release agents. US4732639公开了一些烷基或烷基/羟基-烷基纤维素衍生物(摩尔取代度达3.0)作为污物释放聚合物和/或作为抗再沉积聚合物是有效的。 US4732639 discloses a number of alkyl or alkyl / hydroxy - alkyl derivatives of cellulose (molar substitution degree of 3.0) as a soil release polymer and / or as an anti-redeposition polymer is effective. UK1314897公开了羟基-丙基甲基纤维素用作抗再沉积和污物释放助剂，但是从该文献(如同US6191093中的观察)能够看出对纯棉制品的性能有些不令人满意。 UK1314897 discloses hydroxy - as methylcellulose soil release and anti-redeposition aids, but can be seen from this document (as observed in US6191093) performance somewhat unsatisfactory cotton products. 美国专利6200351公开了适合与聚酯污物释放聚合物组合用作污物释放聚合物的非离子型羟基-烷基纤维素醚，其具体包括羟基-乙基、羟基-丙基和/ 或羟基-丁基纤维素，它们可以另外携带烷基醚基团，更特别是甲基、乙基和/或丙基。 U.S. Patent No. 6,200,351 discloses a polyester soil release polymers suitable for use with compositions as soil release polymer is nonionic hydroxy - alkyl cellulose ethers, which comprises hydroxy - ethyl, hydroxy - propyl and / or hydroxyl - butyl cellulose, which may additionally carry an alkyl ether group, more particularly methyl, ethyl and / or propyl. 对于对棉和聚酯二者均有效并且对水解和酶攻击稳定的沉积体系，存在着需求。  For effective for both the cotton and polyester hydrolysis and enzymatic attack and stable deposition system, there is a need. 找到对其它基体的有效沉积助剂，也有需要。 Found effective deposition aid for the other substrates is also necessary. 目前我们已确定，含有有益剂并使用右旋糖酐作为递送助剂的颗粒对棉和聚酯以及头发是有效的。  We have now determined that the use of dextran containing the beneficial agent and as a delivery aid particles are effective hair and cotton and polyester. 因此，本发明的第一方面提供了一种有益剂递送颗粒，其在所述颗粒的外表面具有一种或多种递送助剂，所述递送助剂为多糖并且包含右旋糖酐。  Accordingly, a first aspect of the present invention there is provided a benefit agent delivery particle, having one or more delivery aid on an outer surface of the particles, and the delivery aid is a polysaccharide comprises dextran. 优选所述递送助剂基本上由右旋糖酐组成。  Preferably, the delivery aid consisting essentially of a dextran. 优选地，所述有益剂递送颗粒包含非多糖聚合物，更优选氨基塑料聚合物。  Preferably, the non-benefit agent delivery particle comprising a polysaccharide polymer, more preferably an aminoplast polymer. 通常， 所述非多糖聚合物以比较大的水不溶性大分子的形式交联。 Usually in the form, the non-polysaccharide polymer with a relatively large water-insoluble crosslinked macromolecules. 优选地，所述有益剂递送颗粒包含香料。  Preferably, the benefit agent delivery particle comprising a perfume. 高度优选的颗粒包含核和至少一层壳，所述核包含有益剂并且所述壳包含水不溶性非多糖聚合物，所述右旋糖酐连接在最外层壳的外表面处。  Highly preferred particle comprises a core and at least one shell, the core comprising a benefit agent and a shell comprising a non-water-insoluble polysaccharide polymers, dextran connecting said outermost surface of the outer shell. 这样的颗粒具有内区，通常形成含有有益剂的"核"，和保护所述有益剂并调节有益剂流入和流出所述核的水不溶性"壳"。  Such particles having an inner region containing the beneficial agent is typically formed of "core", and the protection of beneficial agent and a beneficial agent, adjust the water flow into and out of the core-insoluble "shell." 所述核可以包含有益剂的微滴或可以包含其中吸附了所述有益剂的聚合物基质。 The core may comprise a benefit agent droplets or may contain a beneficial agent wherein the adsorbed polymer matrix. 所述颗粒可以是控制有益剂在内区与其它区域之间热力学(而不是动力学)分配的载体。  The particles may be controlled beneficial agent between the inner region and the other regions of thermodynamic (rather than kinetic) distribution of the carrier. 在需要后期添加香料或其它有益剂的情况下，这是特别有利的，因为所述颗粒和所述有益剂可以因此分别定量配给到产品中。 In cases where the late addition of perfume or other benefit agents, it is particularly advantageous, since the particles and thus the benefit agent may be separately dosing the product. 在可替代方案中，壳很大程度上不能透过有益剂，所述有益剂在壳破裂时释放。 In an alternative embodiment, the shell is not largely, the beneficial agent is released upon rupture of the shell through the beneficial agent. 优选地，所述有益剂递送颗粒包含核和至少一层壳。  Preferably, the benefit agent delivery particle comprising a core and at least one shell. 在特别优选的实施方式中，香料存在于核中，而递送助剂附着于最外层壳的外部。 In a particularly preferred embodiment, the perfume is present in the core, the delivery aid is attached to the outside of the outermost shell. 虽然优选递送助剂与壳直接连接，但其可以通过连接物质连接。 Although the preferred delivery aid is directly connected with the housing, but may be connected by connecting material. 连接是指所述递送助剂不在水中除去，因而所述递送助剂是包封物的永久部分而不是水溶性涂层。  The connection means is not delivering aid water removal, and thus the delivery aid is a permanent part of the encapsulation rather than water soluble coating. 设想本发明的有益剂递送颗粒的另一个益处是，由于所述递送助剂通过与颗粒连接而获得的与棉的亲合力提高，所述颗粒在洗衣应用中也将产生一定的污物释放益处。  The present invention is contemplated benefit agent delivery particle Another benefit is that, due to the force of the delivery aid and improve cotton by affinity particle obtained by connecting, in a laundry application the particles will also have some dirt release benefits. b)至少一种表面活性剂。  b) at least one surfactant. 在特别优选的实施方式中，本发明提供了包含至少一种阴离子或非离子型表面活性剂的液体处理组合物。  In a particularly preferred embodiment, the present invention provides a liquid treatment composition comprising at least one anionic or non-ionic surfactants. 优选地，对于头发和/或皮肤处理组合物而言，所述表面活性剂包含总组合物的至少3wt%的烷基醚硫酸盐。  Preferably, for hair and / or skin treatment composition, the surfactant comprising the total composition of at least 3wt% of an alkyl ether sulfate. 有利地，递送助剂不容易受到水解并且不被通常用于洗衣组合物中的酶攻击。  Advantageously, the delivery aid is less susceptible to hydrolysis and enzymatic attack is not commonly used in laundry compositions. 在优选实施方式中，本发明的洗衣处理组合物包含至少一种以多糖为底物的酶。  In a preferred embodiment, the laundry treatment composition according to the present invention comprises at least one polysaccharide as the enzyme substrate. 优选地，这选自半纤维素酶、纤维素酶(这是特别优选的）、聚半乳糖醛酸酶、木聚糖酶、果胶酶、甘露聚糖酶(这也是特别优选的）、果胶酸裂解酶、木质酶、支链淀粉酶、戊聚糖酶、阿拉伯糖苷酶、透明质酸酶、软骨素酶、漆酶、糖基水解酶、和淀粉酶，或其混合物。 Preferably, it is selected from hemicellulases, cellulases (which is particularly preferred), polygalacturonic acid enzyme, xylanase, pectinase, mannanase (which is particularly preferred), pectate lyase, ligninase, pullulanase, pentosanases, arabinosidases, hyaluronidase, chondroitinase, laccase, glycosyl hydrolases, and amylases, or mixtures thereof. 在另一种优选实施方式中，本发明的组合物含有聚酯酶。 In another preferred embodiment, the compositions of the present invention contains a polyester enzymes. 聚酯酶和多糖底物酶二者都可以存在。 Both enzyme and enzyme polyester polysaccharide substrates may be present. 在这些常见的酶、尤其是纤维素酶存在下，所述递送助剂的稳定性产生显著优于以前已知的基于刺槐豆胶的沉积体系的优势。 In these common enzymes, especially in the presence of cellulase, the delivery aid stability generate significantly better than previously known systems based on the deposition of the advantages of locust bean gum. 在另一种优选实施方式中，本发明的组合物含有聚酯酶。  In another preferred embodiment, the compositions of the present invention contains a polyester enzymes. 聚酯酶和多糖底物酶二者都可以存在。 Both enzyme and enzyme polyester polysaccharide substrates may be present. 进一步优选的组合物包含选自纤维素酶、甘露聚糖酶和其混合物的酶以及含有香料的聚合核-壳颗粒，所述核-壳颗粒的特征在于，右旋糖酐作为递送助剂连接在所述颗粒的壳的外侧。  Further preferred compositions comprise enzymes selected from cellulase, mannanase enzyme, and mixtures thereof and polymeric fragrance-containing core - shell particles, the core - shell particles characterized in that the dextran is connected as a delivery aid in the outer shell of the particles. b)在右旋糖酐存在下，在核-壳颗粒的外表面上形成进一步的聚合物层。  b) in the presence of dextran, the core - shell further polymer layer is formed on the outer surface of the particles. 其中所述有益剂或是在所述方法的步骤(a)期间存在于核中或作为核，或是在后续步骤中吸附到核中。  where present in the core or as a nucleus, the nucleus or adsorbed in the subsequent step or the beneficial agent during the step of the method (a). 为了可以进一步理解本发明，在下面具体参考优选的特征进行进一步详细的描述。  For a further understanding of the present invention may be in the following with particular reference to preferred features described in further detail. 在给出百分比的情况下，除非另有说明，它们是重量百分比。 In the case where the percentages given, unless otherwise indicated, are weight percentages. 类似地，除非另作说明，所有比率都是重量比率。 Similarly, unless otherwise specified, all ratios are weight ratios. 右旋糖酐是α-Dl，6-葡萄糖-连接的葡聚糖，其侧链通过1-3连接到右旋糖酐生物聚合物的主链单元。  Dextran is α-Dl, 6- glucose - linked dextran, which side chain is attached to the dextran backbone units 1-3 through biopolymer. 通常，其支化度为大约5%。 In general, the degree of branching is approximately 5%. 所述支链大部分为1-2个葡萄糖单元长度。 Most of the branched chain length of 1-2 glucose units. 令人吃惊的是，α-1-6多糖对纤维素和聚酯二者表现出任何的亲合力。 Surprisingly, α-1-6 to both cellulose and polyester polysaccharides exhibit any affinity. 优选地，右旋糖酐的分子量高于5kD、更优选高于10kD、并且最优选高于20kD。  Preferably, the higher molecular weight dextran 5kD, more preferably higher than 10 kD, and most preferably greater than 20kD. 有益剂向皮肤、织物或头发提供一系列益处，视情况而定。  The benefit agent provides a range of benefits to the skin, hair or fabric, as the case may be. 所述颗粒中可以掺入各种有益剂。  The particles can be incorporated into a variety of beneficial agents. 在所述颗粒的最终用途与含优选表面活性剂的制剂相关的情况下，可使用能够向用含优选表面活性剂的组合物处理的基体提供益处的任何相容的有益剂。 In the end use of the particles is preferably associated with a formulation containing a surfactant a case, any compatible beneficial agents can provide benefits Into treated matrix composition preferably containing a surfactant. 本发明的颗粒在表面活性剂存在下的优点是在制剂储存时良好保留有益剂并且在产品使用期间和之后可控地释放所述有益剂。 Advantages of the particles of the invention in the presence of a surfactant is beneficial good retention agent when the formulation is stored and then controllably releasing the beneficial agent in the product and during use. 有益剂向布提供一系列益处。  benefit agents provide a range of benefits to the cloth. 这些益处包括对织物的软化、调理、润滑、降低皱褶、 易于熨烫、增湿、保持色彩和/或抗起球、快速干燥、UV防护、保持形状、污物释放、纹理、驱虫、杀真菌、染色和/或荧光益处。 These benefits include softening of fabrics, conditioning, lubricating, reducing wrinkles, ease of ironing, moisturizing, color retention and / or anti-pilling, quick drying, UV protection, shape retention, soil release, texture, insect, fungicidal, staining and / or fluorescence benefit. 高度优选的益处是递送香精(无论游离的和/或包封的）、或香精前体。  Highly preferred benefit is the delivery of perfume (either free and / or encapsulated), or pre flavor thereof. 优选的有益剂是香料(无论游离的和/或包封的）、香精前体、粘土、酶、消泡剂、荧光剂、漂白剂及其前体(包括光漂白）、遮蔽染料和/或颜料、织物调理剂(例如阳离子型表面活性剂，包括水不溶性季铵材料和/或硅氧烷）、润滑剂(例如糖聚酯）、光防护剂(包括防晒剂）、抗氧化剂、还原剂、螯合剂、色彩护理添加剂(包括染料固定剂）、不饱和油、润肤剂、驱虫剂和/或信息素、垂感(drape)调节剂(例如聚合物乳胶颗粒例如PVAc)以及抗微生物和微生物控制剂。  Preferred benefit agents are perfumes (either free and / or encapsulated), flavor precursors, clays, enzymes, antifoaming agents, fluorescent agent, bleaching agents and precursors (including photobleaching), shading dye and / or pigments, fabric conditioning agents (e.g., cationic surfactants, including water-insoluble quaternary ammonium material and / or silicone), lubricants (e.g., a sugar polyester), light protection agents (including sunscreens), anti-oxidants , reducing agents, chelating agents, color care additives (including dye fixing agent), unsaturated oils, emollients, insect repellents, and / or pheromones, drape (drape) modulators (e.g., polymer latex particles e.g. PVAc) and anti-microbial and microbial control agents. 可以使用这些中两种或更多种的混合物。 Mixtures of two or more of these may be used. 具体的有益剂在下面进一步详细描述。 Specific beneficial agents are described in further detail below. 其它优选的有益剂是香味剂和香精、香精前体、粘土、酶、消泡剂、荧光剂、漂白剂及其前体(包括光漂白）、染料和/或颜料、调理剂(例如阳离子型表面活性剂，包括水不溶性季铵材料、脂肪醇和/或硅氧烷）、润滑剂（例如糖聚酯）、色彩保护和光防护剂（包括防晒剂）、抗氧化剂、神经酰胺、还原剂、螯合剂、色彩护理添加剂(包括染料固定剂）、不饱和油、 润肤剂、增湿剂、驱虫剂和/或信息素、垂感调节剂(例如聚合物乳胶颗粒例如PVAc)以及抗微生物和微生物控制剂。  Other preferred benefit agent is perfume and flavoring agents, flavor precursors, clays, enzymes, antifoaming agents, fluorescent agent, bleaching agents and precursors (including photobleaching), dyes and / or pigments, conditioning agents ( for example, cationic surfactants, including water-insoluble quaternary ammonium material, fatty alcohols and / or silicone), lubricants (e.g., a sugar polyester), color protection and light protective agents (including sunscreens), anti-oxidants, ceramides, reducing chelating agents, color care additives (including dye fixing agent), unsaturated oils, emollients, moisturizers, insect repellents and / or pheromones, drape modifiers (e.g., polymer latex particles e.g. PVAc) and anti-microbial and microbial control agents. 可以使用这些中两种或更多种的混合物。 Mixtures of two or more of these may be used. 具体的有益剂在下面进一步详细描述。 Specific beneficial agents are described in further detail below. 对于皮肤组合物来说，优选的有益剂包括香精、增湿剂、防晒剂、皮肤美白剂、抗微生物剂、油和驱虫剂中的一种或多种。  The composition for the skin, the preferred benefit agents include one or more fragrances, moisturizers, sunscreens, skin lightening agents, antimicrobials, insect repellents, and the oil. 对于头发组合物来说，所列举的优选的有益剂是相同的，但加上颜色保护剂和染料。 For hair compositions, the recited preferred benefit agents are the same, but with the color protecting agent and a dye. [0049 ] 优选的抗微生物剂包括Tr ic 1 〇san™、氯咪巴唑、轻甲辛吡酮(〇c tapy r ox)、酮康挫、 吡硫锌和季铵化合物。  Preferred antimicrobial agents include Tr ic 1 〇san ™, climbazole, light armor oct-pyrrolidone (〇c tapy r ox), setback ketoconazole, zinc pyrithione, and quaternary ammonium compounds. 抗头肩剂是适合用于头发处理组合物中的有益剂，其是抗头肩活性的并且通常是抗微生物剂并优选抗真菌剂。  The head and shoulder agent is an anti-hair treatment composition suitable for use in the benefit agent which is an anti-head and shoulders activity and generally preferred antimicrobial and antifungal agents. 抗真菌剂通常对马拉色菌属(Malassezia spp)表现出最低抑菌浓度为约50mg/ml或更低。 Antifungal agents typically Malassezia (Malassezia spp) exhibits a minimum inhibitory concentration of about 50mg / ml or less. 合适的抗头肩有益剂包括选自酮康唑、氯咪巴唑、羟甲辛吡酮、金属吡硫酮盐、及其混合物的化合物。 Suitable benefit agents include anti-selected head and shoulders ketoconazole, climbazole, octopirox, metal salts of pyridinethione, and the compound  mixture. 优选的基于唑的抗真菌剂是酮康唑和氯咪巴唑。 Preferred azole-based antifungal agent is ketoconazole and climbazole. 优选的金属吡硫酮盐是吡硫锌、铜、银和锆。  Preferred pyridinethione metal salt is zinc pyrithione, copper, silver, and zirconium. 最优选的是吡硫锌。 Most preferred is zinc pyrithione. 优选地，所述抗头肩活性剂以组合物的0.01至5wt%存在，更优选为所述组合物的0.1至2.5wt%。  Preferably, the active agent is an anti-head and shoulders of 0.01 to 5wt% of the present composition, more preferably 0.1 to 2.5wt% of the composition thereof. 优选的防晒剂和/或皮肤美白剂是维生素B3化合物。  Preferred sunscreen agents and / or skin-whitening agent is a vitamin B3 compound. 合适的维生素B3化合物选自烟酸、烟酰胺、烟醇、或者其衍生物或盐。 Suitable vitamin B3 compounds are selected from niacin, niacinamide, nicotinyl alcohol, or a derivative or salt thereof. 起皮肤美白剂作用的其它维生素可有利地包含在皮肤美白组合物中，以提供附加的皮肤美白效应。 Other vitamins from skin lighteners may advantageously comprise a role in skin lightening compositions to provide additional skin whitening effect. 这些包括维生素B6、维生素C、维生素A或它们的前体。 These include vitamin B6, vitamin C, vitamin A or their precursors. 本发明的组合物中还可以使用所述维生素的混合物。 The composition of the present invention the mixture of vitamins may also be used. 特别优选的其他维生素是维生素B6。 Particularly preferred additional vitamin is vitamin B6. 本文中有用的皮肤美白剂的其它非限制性例子包括阿达帕林、芦荟提取物、乳酸铵、熊果酚甙、壬二酸、丁基羟基茴香醚、丁基羟基甲苯、柠檬酸酯、脱氧熊果酚甙、1，3_二苯基丙烷衍生物、2,5二-羟基苯甲酸及其衍生物、2-(4-乙酰氧基苯基）-1，3-二噻烷(dithane)、2-(4-羟基苯基)-1，3_二噻烷、鞣花酸、葡糖吡喃基-1-抗坏血酸、葡糖酸、羟基乙酸、绿茶提取物、4-羟基-5-甲基-3[2H]_呋喃酮、氢醌、4-羟基茴香醚及其衍生物、4-羟基苯甲酸衍生物、羟基辛酸、肌醇抗坏血酸酯、曲酸、乳酸、柠檬提取物、亚油酸、抗坏血酸基磷酸镁、5-辛酰基水杨酸、2，4-间苯二酚衍生物、3，5-间苯二酚衍生物、水杨酸、3，4，5-三羟基苯甲基衍生物、及其混合物。 Other useful herein, non-limiting examples of skin lightening agents include adapalene, aloe extract, ammonium lactate, arbutin phenol glycosides, azelaic acid, butyl hydroxy anisole, butyl hydroxy toluene, citrate esters, deoxy bearberry phenolic glycosides, 1,3_ diphenyl propane derivatives, 2,5 - dihydroxybenzoic acid and its derivatives, 2- (4-acetoxy-phenyl) -1,3-dithiane (Dithane ), 2- (4-hydroxyphenyl) -1,3_ dithiane, ellagic acid, gluconic pyran-1-ascorbic acid, gluconic acid, glycolic acid, green tea extract, 4-hydroxy-5 - methyl -3 [2H] _ -furanone, hydroquinone, 4-hydroxy anisole and its derivatives, 4-hydroxy benzoic acid derivatives, hydroxycaprylic acid, inositol ascorbate, kojic acid, lactic acid, lemon extract, linoleic acid, magnesium ascorbyl phosphate, 5-octanoyl salicylic acid, 2,4 resorcinol derivatives, 3,5 resorcinol derivatives, salicylic acid, 3,4,5-tris hydroxy methyl derivative thereof, and mixtures thereof. 可用于本发明的优选的防晒剂是2-乙基己基-对-甲氧基肉桂酸酯、丁基甲氧基二苯甲酰甲烷、2-羟基-4-甲氧基二苯甲酮、辛基二甲基-对-氨基苯甲酸、 及其混合物。 Preferred sunscreen agents can be used in the present invention are 2-ethylhexyl - on - methoxycinnamate, butyl methoxy dibenzoyl methane, 2-hydroxy-4-methoxy-benzophenone, octyl dimethyl - on - aminobenzoic acid, and mixtures thereof. 特别优选的防晒剂选自2-乙基己基-对-甲氧基肉桂酸酯、4-叔丁基-4'-甲氧基二苯甲酰甲烷、或其混合物。 Particularly preferred sunscreens are selected from 2-ethylhexyl - on - methoxycinnamate, 4-tert-butyl-4'-methoxy dibenzoylmethane, and mixtures thereof. 适合用于本发明的皮肤美白组合物中的其它常规防晒剂包括2-羟基-4-甲氧基二苯甲酮、辛基二甲基-对-氨基苯甲酸、二没食子酰基三油酸酯、2，2-二羟基-4-甲氧基二苯甲酮、乙基-4-(双(羟丙基)氨基苯甲酸酯、2-乙基己基-2-氰基-3,3-二苯基丙烯酸酯、2-乙基己基水杨酸酯、甘油基-对-氨基苯甲酸酯、3，3，5-三甲基环己基水杨酸酯、氨茴酸甲酯、对-二甲基氨基苯甲酸或氨基苯甲酸酯、2-乙基己基-对二甲基氨基苯甲酸酯、2-苯基苯并咪唑-5-磺酸、2-(对二甲基氨基苯基)-5-磺基苯并噁唑酸，和这些化合物的混合物。 Other conventional sunscreen agents suitable for use in skin lightening composition of the present invention include 2-hydroxy-4-methoxy-benzophenone, octyl dimethyl - p - Amino benzoic acid, gallic acid trioleate , 2,2-dihydroxy-4-methoxy benzophenone, ethyl-4- (bis (hydroxypropyl) aminobenzoate, 2-ethylhexyl-2-cyano-3,3 - diphenylacrylate, 2-ethylhexyl salicylate, glyceryl - on - aminobenzoate, 3,3,5-trimethyl-cyclohexyl salicylate, methyl anthranilate, on - dimethylaminobenzoic acid or aminobenzoate, 2-ethylhexyl - methyl p-aminobenzoate, 2-phenylbenzimidazole-5-sulfonic acid, 2- (p-dimethoxyphenyl amino-phenyl) -5-sulfo-mercaptobenzoxazole acid mixtures of these compounds. 优选的抗氧化剂包括维生素E、视黄醇、基于羟基甲苯的抗氧化剂例如Irganox™或可商购的抗氧化剂例如Trollox™系列。  Preferred antioxidants include vitamin E, retinol, hydroxy toluene antioxidant based on, for example, Irganox ™ or commercially available antioxidants such as Trollox ™ series. 递送助剂与颗粒连接，所述颗粒或者本身包含有益剂，或者本身是有益剂的载体。  connected to the delivery aid and particles, or the particles comprising benefit agent itself, or the carrier itself is beneficial agents. 这样的例子将是颗粒表面连接了递送助剂的香料、抗头肩剂、驱虫剂或其它有益剂载体颗粒。 Such examples will be connected to the particle surface perfume delivery aid, anti head and shoulders, insect repellents or other beneficial agent carrier particles. 虽然优选使用聚合物颗粒，优选核壳包封物，但许多其它类型的颗粒可以被设想为有益剂载体。  While it is preferred to use the polymer particles, preferably core-shell encapsulation, but many other types of particles may be conceived as the beneficial agent carrier. 香料已经吸附在粘土或沸石材料上，所述材料然后混合到微粒洗涤剂组合物中： 美国专利No. 4，539，135公开了包含负载有香料的粘土或沸石材料的微粒洗衣用化合物。  The perfume has been adsorbed onto a clay or zeolite material which is then mixed into the particulate detergent compositions: U.S. Patent No. 4,539,135 discloses a laundry particle comprising clay or perfume loaded zeolite material by compound. 本领域还教导了香料通常与孔隙尺寸较大的沸石例如沸石X和Y的组合。 This art also teaches that the combination is usually larger pore size zeolites such as zeolite perfume X and Y. 东德专利公布No. 248，508涉及香料分配剂，其含有负载了香料的八面沸石型沸石(例如沸石X和Y)。 East German Patent Publication No. 248,508 relates to a perfume dispensing agent, containing faujasite type zeolite loaded (e.g., zeolite X and Y) fragrance. 此外， 1979年9月12日公布的东德专利公布No. 137，599教导了用于粉末洗涤剂中以提供热调节香料释放的组合物。 Further, September 12, 1979 published East German Patent Publication No. 137,599 teaches a composition for a powder detergent to provide thermal conditioning of perfume release. 沸石A、X和Y被教导可用于这些组合物。  Zeolite A, X and Y are taught may be used in these compositions. The Procter&Gamble公布的W097/34982和TO98/41607教导了其它香料递送体系。 The Procter & Gamble announced W097 / 34982 and TO98 / 41607 teaches other perfume delivery system. W097/34982公开了包含负载香料的沸石和释放屏障的颗粒，释放屏障是来源于蜡的作用剂并且尺寸（即横截面积)大于所述沸石载体的孔隙开口的尺寸。 W097 / 34982 discloses a zeolite and a release barrier particles comprising perfume loaded, the release of the barrier from the size pore openings and the size of the wax agent (i.e., cross-sectional area) larger than the zeolite carrier. W098/41607公开了包含可用于洗衣或清洁组合物的作用剂和来源于一种或多种至少部分水溶性羟基化合物的玻璃的玻璃状颗粒。 W098 / 41607 discloses glassy particles comprising agents may be used in laundry or cleaning compositions and a glass derived from one or more water soluble hydroxy compound is at least partially. [0061 ]二氧化硅、非晶硅酸盐、结晶非层状硅酸盐、层状硅酸盐、碳酸钙、碳酸钙/钠复盐、 碳酸钠、方钠石、碱金属磷酸盐、果胶、几丁质微球、羧烷基纤维素、树胶、树脂、明胶、阿拉伯胶、多孔淀粉、改性淀粉、羧烷基淀粉、环糊精、麦芽糊精、合成聚合物例如聚乙烯基吡咯烷酮(PVP)、聚乙烯醇(PVA)、纤维素醚、聚苯乙烯、聚丙烯酸酯、聚甲基丙烯酸酯、聚烯烃、氨基塑料聚合物、交联剂及其混合物全部可提供香料颗粒的基础。  silica, amorphous silicates, crystalline non-layered silicates, layered silicates, calcium carbonate, calcium / sodium salt complex, sodium carbonate, sodalite, alkali metal phosphates, fruit gum, chitin microbeads, carboxyalkyl celluloses, gums, resins, gelatin, gum arabic, porous starches, modified starches, carboxyalkyl starches, cyclodextrins, maltodextrins, synthetic polymers such as polyvinyl pyrrolidone (PVP), polyvinyl alcohol (PVA), cellulose ethers, polystyrene, polyacrylates, polymethacrylates, polyolefins, aminoplast polymers, crosslinkers and mixtures thereof, all of which may provide a flavor particles basis. 然而聚合物颗粒是优选的，尤其是包含氨基塑料聚合物的聚合物颗粒。  However, the polymer particles are preferred, especially an aminoplast polymer particles comprising polymer. 负载有有益剂的颗粒的大小通常在100纳米和50微米之间。  loaded with a beneficial agent particle size is generally between 100 nanometers and 50 micrometers. 大于这个范围的颗粒进入可见范围。 Greater than this range of particles into the visible range. 优选的粒度范围在亚微米范围或微米范围中。  The preferred particle size range submicron range or in the micrometer range. 亚微米范围的合适的颗粒包括纳米颗粒、胶乳、和通常尺寸范围为100-600纳米的细乳液产品。  Suitable particles include nano sub-micron range particles, latex, and the size range typically 100 to 600 nm miniemulsion products. 微米范围的合适的颗粒包括已知的三聚氰胺/脲-甲醛包封物、二氧化硅、粘土淀粉和沸石颗粒类型，以及通常尺寸范围为1-50微米、优选5-30微米的团聚体。 Suitable particles  micrometer range include known melamine / urea - formaldehyde encapsulation, silica, clay and starch type zeolite particles, and the size range is generally from 1 to 50 microns, preferably 5-30 microns agglomerated body. 在本发明的一个优选的方面，作为沉积助剂的右旋糖酐与至少部分预先形成的颗粒连接。  In a preferred aspect of the invention, as a deposition aid particles are at least partially connected to the dextran preformed. 递送助剂利用共价键、缠结或强吸附与颗粒结合，优选通过共价键或缠结，最优选利用共价键。  the delivery aid using a covalent bond, entanglement or strong adsorption and binding particles, preferably by covalent bond or entanglement and most preferably a covalent bond. 缠结在本文中使用时是指递送助剂随着聚合进行和颗粒尺寸生长而吸附在颗粒上。 When entanglement is used herein refers to the delivery aid as the polymerization proceeds and the particle size growth adsorbed on the particles. 据认为在这样的情况下，部分吸附递送助剂埋藏在所述颗粒的内部之中。 It is believed that in such a case, the adsorption portion of the delivery aid buried in the interior of the particles being. 因此在聚合结束时，部分递送助剂夹带和结合在颗粒的聚合物基质中，而其余的自由扩散到水相中。 Thus at the end of the polymerization, part of the delivery aid and entrained particles bound in a polymer matrix, whereas the remaining free to diffuse into the aqueous phase. 所述递送助剂优选主要与颗粒表面连接并且在整个颗粒的内部主体上没有任何显著程度的分布。  The delivery aid is preferably connected to the main surface of the particles without any significant extent distributed over the entire particle of the inner body. 因此，当根据本发明的优选方法使用递送助剂时产生的所述颗粒可以被认为是"毛球"。 Thus, the particles when the delivery aid using a preferred method of the invention may be produced as a "hair ball." 如上所述，重要的是所述右旋糖酐递送助剂不被水除去，因为它然后不能有效起到递送助剂的功能。 As described above, it is important to deliver the dextran is not aid removal of water, because then it could not function effectively aid delivery functions. 因此，例如所述右旋糖酐在颗粒上的喷雾干燥涂层将不会使得所述右旋糖酐成为有效的递送助剂，因为所述右旋糖酐将在暴露于水时从颗粒上除去。 Thus, for example, the spray-dried dextran coating on the particles will not be such that the effective delivery aid dextran, dextran since the particles removed from the water when exposed to. 本发明的聚合物载体颗粒可包含广泛选择的单体单元。  The polymeric carrier particles of the invention may comprise a wide choice of monomer units. "单体单元"在本文中使用时是指聚合物链的单体单元，因此在本文中使用时提及"包含不溶性单体单元的聚合物颗粒"是指所述聚合物颗粒来源于不溶性单体，以此类推。 "Monomer unit" as used herein refers to a monomeric unit of the polymer chain, thus references to "a polymer particle comprising insoluble monomer units" as used herein, means that the insoluble polymer particles derived from a single body, and so on. 如上所述，所述单体单元优选来源于适合逐步增长聚合或加成/自由基聚合的单体。  As described above, the monomer unit is preferably derived from a suitable step-growth polymerization or addition / radical polymerizable monomers. 如上所述的氨基塑料(例如三聚氰胺/甲醛或脲/甲醛)核/壳颗粒，有益剂存在于核中而壳聚糖盐递送助剂与壳的外表面连接，是特别优选的。 Aminoplast as described above (e.g., melamine / formaldehyde or urea / formaldehyde) is present core / shell particles, the beneficial agent delivery aid of the shell and the outer surface of the core is connected to the chitosan salt, is particularly preferred. 在颗粒本身不是有益剂的情况下，有益剂通常以载体颗粒总重量的10-85%的量存在，优选为所述颗粒总重量的20至75%。  In the case where the particle itself is not beneficial agent, the beneficial agent is generally in an amount of 10-85% of the total weight of the carrier particles are present, preferably 20 to 75% of the total weight of the particles. 虽然对本发明必要的是所述递送助剂包含右旋糖酐，但所述颗粒的表面处可以存在其他递送助剂。  Although it is necessary that the delivery aid comprising dextran, the surface of the particles may be present at other delivery aid of the present invention. 它们可以有利地选自纤维素衍生物和聚酯，从而与多种基体产生更好的亲和性。 They can advantageously be selected from cellulose derivatives and polyesters, resulting in better affinity for a variety of substrates. 特别优选的其他多糖沉积助剂包括壳聚糖、羟基-丙基甲基纤维素、羟基-乙基甲基纤维素、羟基-丙基瓜儿胶、羟基-乙基乙基纤维素、甲基纤维素、刺槐豆胶、木葡聚糖、瓜尔胶。 Particularly preferred deposition aids include other polysaccharides chitosan, hydroxy - propyl methyl cellulose, hydroxy - ethyl methyl cellulose, hydroxy - propyl children guar gum, hydroxy - ethyl ethyl cellulose, methyl cellulose, locust bean gum, xyloglucan, guar gum. 特别优选的其他聚酯沉积助剂包括具有一种或多种包含氧化乙烯、聚氧化乙烯、氧化丙烯或聚氧化丙烯链段的非离子性亲水组分、和一种或多种包含对苯二甲酸酯链段的疏水组分的聚合物。 Particularly preferred deposition aids include other polyesters having one or more of ethylene oxide comprising, polyoxyalkylene nonionic hydrophilic component for ethylene oxide, propylene or polyoxypropylene segments, and one or more of terephthalic comprising dicarboxylate polymeric hydrophobic component segments. 香料是挥发性有益剂的一个例子。  Examples of the volatile perfume is a benefit agent. 通常的挥发性有益剂具有50至500的分子量。 Volatile benefit generally has a molecular weight of 50 to 500. 所述香料适合具有50至500的分子量。 The perfume suitably has a molecular weight of 50 to 500. 在使用香精前体的情况下，所述分子量通常将更高。 In the case of flavor before use thereof, the molecular weight generally will be higher. 有用的香料组分包括天然和合成这两种来源的材料。  Useful perfume ingredients include natural and synthetic materials these two sources. 它们包括单个化合物和混合物。 They include single compounds and mixtures. 这类组分的具体例子可以在现行文献中找到，例如，Fenaroli's Handbook of Flavour Ingredients，1975，CRC Press;Van Nostrand编著的Synthetic Food Adjuncts，1947， Μ.B·Jacobs;或Perfume and Flavour Chemicals,S.Arctander1969,Montelair,NJ (USA)。 Specific examples of such components may be found in the current literature, for example, Fenaroli's Handbook of Flavour Ingredients, 1975, CRC Press; Van Nostrand eds Synthetic Food Adjuncts, 1947, Μ.B · Jacobs; or Perfume and Flavour Chemicals, S .Arctander1969, Montelair, NJ (USA). 这些物质是香化、调味和/或芳香化消费产品领域技术人员公知的，所述领域即向传统上香化或调味的消费产品赋予气味和/或香味或味道，或改变所述消费产品的气味和/或味道。 These materials are sweetening, flavoring and / or aromatising consumer products known to those skilled in the art, namely the field of conventional incense or flavored consumer products to impart odor and / or flavor or aroma, or changing the consumable product smell and / or taste. 在这里香料不仅是指完全配制的产品香精，而且是该香精的选择组分，特别是易于损失的那些，例如所谓的"头香（top note)"。  herein refers not only perfumes fully formulated product fragrance, but also selected components of that fragrance, particularly those that are easily lost, for example, so-called "top-notes (top note)". 所述香料组分还可以是香精前体的形式。 The flavor component can also be in the form of fragrance precursor. W02002/038120(P&G)，例如，涉及光不稳定的香精前体接合物，其经暴露于电磁辐射后能够释放芳香物质。 W02002 / 038120 (P & G), for example, relates to fragrance precursor conjugate photolabile which upon exposure to electromagnetic radiation is capable of releasing the fragrance. 头香由Poucher定义（Journal of the Society of Cosmetic Chemists6(2):80 )。  Top notes are defined by Poucher (Journal of the Society of Cosmetic Chemists6 (2): 80 ). 公知的头香的例子包括柑桔油、里哪醇、乙酸里哪酯、熏衣草、二氢月桂烯醇、玫瑰醚和顺式-3-己醇。 Examples of well known top-notes include citrus oils, linalool, linalyl acetate, lavender, dihydromyrcenol, rose oxide and cis-3-hexanol. 头香通常占香料组合物的15-25wt%，并且在含有增加的头香水平的那些本发明实施方式中，设想在所述包封物内将存在至少20wt%。 Top notes typically comprise 15-25wt% perfume composition and in those embodiments of the present invention contains an increased level of top-notes it is envisaged within the encapsulant will be present at least 20wt%. [0079 ]对包封有利的典型香料组分包括沸点比较低的那些，优选沸点低于300、优选100-250摄氏度的那些。  Typical encapsulation advantageously comprises a relatively low boiling perfume ingredients, preferably those boiling below 300, preferably those of 100-250 degrees Celsius. 制剂中存在多种香料组分是很寻常的。  There are various perfume components in the formulation is very unusual. 在本发明的包封物中，设想将有四种或更多、优选五种或更多、更优选六种或更多或甚至七种或更多不同的上面给出的延迟释放香料成分存在于包封的香料中。 In the encapsulant of the present invention, the envisaged four or more, preferably five or more, more preferably six or more or even seven or more release delaying given above, the presence of different perfume ingredients in encapsulated fragrances. 部分或全部所述香料可以是香精前体的形式。  Part or all of the flavor precursors may be in the form of fragrance. 对于本发明，香精前体是包含可转变成香精的香精前体的任何材料。 For the present invention, comprising fragrance precursors can be converted into any material of the front body fragrance flavor. 香精前体可以是例如食用脂质。 Flavor precursors may be, for example edible lipid. 食用脂质通常含有具有明显疏水性的结构单元。 Edible lipids generally contain structural units having distinct hydrophobic. 脂质大部分源自于脂肪酸。 Most lipids derived from fatty acids. 在这些"酰基"脂质中，脂肪酸主要作为酯存在，并包括单_、二_、三酰基甘油、磷脂、糖脂、二醇脂、蜡、固醇酯和生育酚。 In the "acyl" lipids, fatty acids are predominantly present as esters and include mono- _, _ two, triacylglycerols, phospholipids, glycolipids, aliphatic glycols, waxes, sterol esters and tocopherols. 在它们的天然状态，植物脂质包含抗氧化剂以防止它们氧化。 In their natural state, plant lipids comprise antioxidants to prevent their oxidation. 虽然这些可以在从植物中分离油期间至少部分除去，但可以保留一部分抗氧化剂。 While these may be at least partially removed during the separation of the oil from a plant, but may retain a portion of the antioxidants. 这些抗氧化剂可以是香精前体。 These antioxidants may be flavor precursors. 具体地说，类胡萝卜素和相关化合物包含维生素A、视黄醇、视黄醛、视黄酸和维生素A原能够转变成芳香物质，包含紫罗兰酮、二氢大马酮和大马酮。 Specifically, the carotenoids and related compounds comprising vitamin A, retinol, retinal, retinoic acid and vitamin A can be converted to aromatic substances, comprising ionone, damascone and damascenone. 优选的香精前体食用脂质包括橄榄油、棕榈油、芥花油、角鲨烯、向日葵籽油、小麦胚芽油、杏仁油、椰子油、葡萄籽油、菜籽油、蓖麻油、玉米油、棉籽油、红花油、花生油、罂粟籽油、棕榈仁油、米糠油、芝麻油、大豆油、南瓜子油、霍霍巴油和芥子油。 Preferred perfume precursors edible lipids include olive oil, palm oil, canola oil, squalene, sunflower seed oil, wheat germ oil, almond oil, coconut oil, grape seed oil, rapeseed oil, castor oil, corn oil , cottonseed oil, safflower oil, peanut oil, poppy seed oil, palm kernel oil, rice bran oil, sesame oil, soybean oil, pumpkin seed oil, jojoba oil and mustard oil. 合适的香精前体是产生醛香料组分的那些。  Suitable flavor precursors are those which produce an aldehyde perfume components. 可用于香料的醛包括但不限于苯基乙醛、对甲基苯基乙醛、对异丙基苯基乙醛、甲基壬基乙醛、苯基丙醛、3-(4-叔丁基苯基)-2_ 甲基丙醛、3-(4-叔丁基苯基)-丙醛、3-(4-甲氧基苯基)-2-甲基丙醛、3-(4-异丙基苯基)-2-甲基丙醛、3-(3,4_亚甲基二氧苯基)-2-甲基丙醛、3-(4-乙基苯基)-2,2_二甲基丙醛、苯基丁醛、3-甲基-5-苯基戊醛、己醛、反式-2-已烯醛、顺式-己-3-烯醛、庚醛、顺式-4-庚烯醛、2-乙基-2-庚烯醛、2,6_二甲基-5-庚烯醛、2,4_庚二烯醛、辛醛、2-辛烯醛、3，7_二甲基辛醛、3,7-二甲基-2,6-辛二烯-1-醛、3,7-二甲基-1,6-辛二烯-3-醛、3,7-二甲基-6-辛烯醛、3，7-二甲基-7-羟基-辛-1 -醛、壬醛、6-壬烯醛、2，4-壬二烯醛、2，6-壬二烯醛、癸醛、2-甲基癸醛、4-癸烯醛、9-癸烯醛、2，4-癸二烯醛、十一醛、2-甲基癸醛、2-甲基十一醛、2，6， 10-三甲基-9-十一烯醛、十一-10-烯醛 Aldehyde flavor may be used include, but are not limited to phenylacetaldehyde, p-methyl phenylacetaldehyde, p-isopropyl phenyl acetaldehyde, methyl nonyl acetaldehyde, propionaldehyde phenyl, 3- (4-tert-butyl phenyl) -2_-methylpropanal, 3- (4-tert-butylphenyl) - propanal, 3- (4-methoxyphenyl) -2-methylpropanal, 3- (4 isopropylphenyl) -2-methylpropanal, 3- (3,4_ methylenedioxyphenyl) -2-methylpropanal, 3- (4-ethylphenyl) -2, 2_-dimethylpropanal, phenylbutanal, 3-methyl-5-phenyl pentanal, hexanal, trans-2-hexenal, cis - hex-3-enal, heptanal cis-4-heptenal, 2-ethyl-2-heptenal, 2,6_-dimethyl-5-heptenal, 2,4_-heptadienal, octanal, 2-octene aldehydes, 3,7_-dimethyloctanal, 3,7-dimethyl-2,6-octadiene-1-al, 3,7-dimethyl-1,6-octadiene -3- aldehyde, 3,7-dimethyl-6-octenal, 3,7-dimethyl-7-hydroxy - oct-1 -, nonanal, 6-nonenal, 2,4-nonadienal aldehyde, 2,6-nonadienal, decanal, 2-methyl decanal, 4-decenal, 9-decenal, 2,4-decadienal, undecanal, 2-methyl decanal, 2-methyl undecanal, 2,6, 10-trimethyl -9- undecylenic aldehyde, undecyl -10- enal 、十一-8-烯醛、十二醛、十三醛、十四醛、茴香醛、波洁红醛(bourgenonal)、肉桂醛、a-戊基肉桂醛、a-己基肉桂醛、甲氧基肉桂醛、香茅醛、羟基香茅醛、异环柠檬醛、香茅基氧基乙醛、皮质醛、枯茗醛、仙客来醛、花青醛、胡椒醛、水溶醛、 铃兰醛、香草醛、乙基香草醛、苯甲醛、对甲基苯甲醛、3,4-二甲氧基苯甲醛、3-和4-(4-羟基-4-甲基-戊基)-3-环己烯-1-甲醛、2,4_二甲基-3-环己烯-1-甲醛、1-甲基-3-(4-甲基戊基)-3-环己烯-甲醛、对甲基苯氧基乙醛、及其混合物。 , Undec-8-ene aldehyde, dodecyl aldehyde, tridecyl aldehyde, myristic aldehyde, anisic aldehyde, aldehyde red waves clean (bourgenonal), cinnamic aldehyde, amyl cinnamic aldehyde A-, A- hexyl cinnamic aldehyde, methoxy cinnamic aldehyde, citronellal, hydroxy citronellal, iso-cyclocitral, citronellyl oxyacetaldehyde, cortical aldehyde, cumin aldehyde, cyclamen aldehyde, cyanine aldehyde, piperonal, water-soluble aldehyde, lily of the valley aldehyde, vanillin, ethyl vanillin, benzaldehyde, p-methyl benzaldehyde, 3,4-dimethoxybenzaldehyde, 3- and 4- (4-hydroxy-4 - pentyl) -3 - cyclohexene-1-carbaldehyde, 2,4_-dimethyl-3-cyclohexene-1-carbaldehyde, 1-methyl-3- (4-methylpentyl) -3-cyclohexene - carbaldehyde , methyl phenoxy acetaldehyde, and mixtures thereof. 本发明可以应用的另一类香料是所谓的"芳香治疗"材料。  Another class of perfumes of the present invention can be applied are the so called 'aromatherapy' materials. 这些包括许多也用于香料中的组分，包括香精油例如鼠尾草、桉树、天竺葵、熏衣草、肉豆蔻提取物、橙花油、肉豆蔻、留兰香、香堇菜叶和缬草的组分。 These include many components also used in perfumery, including essential oils, for example, sage, eucalyptus, Geranium, Lavender, Mace Extract, Neroli, Nutmeg, Spearmint, Sweet Violet Leaf and Valerian component grass. 借助于本发明，这些材料可以转移到将穿着到或以其它方式接触到人体的纺织品（例如手帕和床单)或直接沉积在人类皮肤或头发上。 By means of the invention, these materials can be transferred to be worn or otherwise to come into contact with the body of textiles (e.g., handkerchiefs and bed linen) or deposited directly on human skin or hair. 所述挥发性有益剂还包括驱虫剂材料(其中虫应该广义理解为包括是节肢动物的其它害虫，而不是严格的六足虫一一例如壁虱）。 The  volatile benefit agent further comprises an insect repellent material (wherein the insects should be broadly understood to include other pests arthropods, rather than strictly hexapod insects ticks e.g. eleven). 这些材料中许多与香料组分的类别重叠， 并且一些是对人无味或具有不香的气味。 Many classes of these materials and fragrance components overlap, and some are not human odorless or having a fragrant odor. 通常使用的驱虫剂包括:DEET(N，N_二乙基-间-甲苯酰胺）、梓檬桉(Corymbia citriodora)的精油和它的活性化合物对薄荷烧-3,8-二醇(PMD)、埃卡瑞丁亦称派卡瑞丁、D-苎烯、羟哌酯、和KBR3023、荆芥内酯亦称"猫薄荷油"、香茅油、氯菊酯、印度楝树油和香杨梅。 Repellents commonly used include: DEET (N, N_-diethyl - inter - toluamide), Zi lemon eucalyptus (Corymbia citriodora) and its activity is essential oil compound burn menthane-3,8-diol (PMD ), also known as icaridin send Caridin, D- limonene, hydroxyalkyl esters piperazine, and KBR3023, nepetalactone also known as "cat mint oil", citronella, permethrin, neem oil and fragrant bayberry. 已知源自于天然来源的驱虫剂包括:高山蓍(Achillea alpina)，a-砲品稀，罗勒油（罗勒（Ocimum basilicum))，美洲紫珠（Callicarpa americana)(紫珠属），樟脑，香序酸，蓖麻油（篦麻(Ricinus communis))，猫薄荷油（荆芥属物种），雪松油（北非雪松(Cedrus atlantica))，序菜提取物(序菜(Apium graveolens))， 肉桂(斯里兰卡肉桂(Cinnamomum Zeylanicum)，叶油），香茅油(Cymbopogon fleusus)、丁香油（丁香(Eugenic caryophy 1 lata))，桉树油（70%+桉油精，亦称桉油酸），小茴香油（小茴香(Foeniculum vulgare))，大蒜油（大蒜(Allium sativum)，香叶油（亦称香叶天竺葵(Pelargonium graveo lens))，熏衣草油（熏衣草（Lavandula officinalis))，梓檬桉(Corymbia citriodora)精油和它的活性成分对-薄荷烧-3,8-二醇(PMD)，香茅草油（曲序香茅（Cymbopogon f lexuosus))，万寿菊（万寿菊属物种），马郁兰（二斑叶螨（Tetranychus urticae)和东方 Known repellent derived from natural sources include: Alpine Achillea (Achillea alpina), a- gun dilute product, basil oil (basil (Ocimum basilicum)), American Callicarpa (Callicarpa americana) (callicarpa), camphor Hong acid sequence, castor oil (ricin (Ricinus communis)), cat mint oil (Nepeta spp. ), cedar oil (Cedrus Atlantica (Cedrus atlantica)), order food extract (order dishes (Apium graveolens)), cinnamon (Sri Lanka cinnamon (Cinnamomum zeylanicum), leaf oil), citronella (Cymbopogon fleusus), eugenol (clove (Eugenic caryophy 1 lata)), eucalyptus oil (+ 70% eucalyptol, eucalyptus known as oleic acid), fennel oil (fennel (Foeniculum vulgare)), garlic oil (garlic (Allium sativum), geranium oil (also known as Pelargonium (Pelargonium graveo lens)), lavender oil (lavender (Lavandula officinalis)) , Zi lemon eucalyptus (Corymbia citriodora) oil and its active ingredients - menthol burn-3,8-diol (the PMD), lemongrass oil (Cymbopogon flexuosus (Cymbopogon f lexuosus)), marigold (tagetes species), marjoram (two-spotted spider mite (Tetranychus urticae) and the East 叶螨(Eute tranychus oriental is))、印度楝树油（印度楝(Azadirachta indica))，油酸，薄荷(Mentha x piperita)，薄荷类（胡薄荷(Mentha pulegium))，除虫菊属(来自菊花种，特别是除虫菊(C. cinerariifolium)和红花除虫菊(C. coccineum))，迷迭香油（迷迭香（Rosmarinus officinalis)，马缕丹（Lantana camara)(茶角盲畴(Helopeltis theivora))，红果龙葵（Solanum villosum)衆果汁，茶树油（互叶白千层(Melaleuca alternifolia))和百里香(百里香属物种），及其混合物。 Spider mites (Eute tranychus oriental is)), neem oil (neem (Azadirachta indica)), oleic acid, peppermint (Mentha x piperita), mint (Hu mint (Mentha pulegium)), is a pyrethrum (from chrysanthemum species especially pyrethrum (C. cinerariifolium) and safflower pyrethrum (C. coccineum)), rosemary oil (rosemary (Rosmarinus officinalis), Ma Dan thread (Lantana camara) (tea corner blind domains (Helopeltis theivora)), Hongguo nightshade (Solanum villosum) all the juices, tea tree (Melaleuca (Melaleuca alternifolia)) and thyme (Thymus spp. ), and mixtures thereof. 所述香料可以单独包封或与载体材料、其它沉积助剂和/或固定剂共同包封。 The  perfumes may be encapsulated alone or with the support material, other deposition aid and / or fixing agent encapsulated together. 在载体颗粒中待与香料共同包封的优选材料包括蜡、石蜡、稳定剂和固定剂。 Preferably the fragrance material to be encapsulated in a common carrier particles include waxes, paraffins, stabilizers and fixing agent. 载体颗粒的任选的仍然优选的组分是甲醛清除剂。  Optionally the carrier particles are still preferred component is a formaldehyde scavenger. 在可能包含甲醛作为载体颗粒制造过程的结果或组分的载体颗粒中，这是特别有利的。 In the result of the carrier particles or components may contain formaldehyde as carrier particles during manufacturing, which is particularly advantageous. 甲醛清除剂选自：亚硫酸氢钠，脲， 半胱氨酸，半胱胺，赖氨酸，甘氨酸，丝氨酸，肌肽，组氨酸，谷胱甘肽，3，4_二氨基苯甲酸，尿囊素，甘脲，氨茴酸，氨茴酸甲酯，4-氨基苯甲酸甲酯，乙酰乙酸乙酯，乙酰乙酰胺，丙二酰胺，抗坏血酸，1，3-二羟基丙酮二聚体，双缩脲，草酰胺，苯胍胺，焦谷氨酸，连苯三酚，没食子酸甲酯，没食子酸乙酯，没食子酸丙酯，三乙醇胺，琥珀酰胺，噻苯唑，苯并三唑，三唑，二氢吲哚，磺胺酸，草酰胺，山梨糖醇，葡萄糖，纤维素，聚（乙烯醇），聚（乙烯胺），己二醇，乙二胺-N，N'_双乙酰乙酰胺，N-(2_乙基己基）乙酰乙酰胺，N-(3_苯基丙基）乙酰乙酰胺，铃兰醛，新洋茉莉醛，甜瓜醛，女贞醛(triplal)，5,5-二甲基-1，3-环己烷二酮，2,4_二甲基-3-环己烯甲醛，2,2_二甲基-1，3-二氧己环-4,6-二酮，2-戊酮，二丁胺， Formaldehyde scavenger is selected from: sodium bisulfite, urea, cysteine, cysteamine, lysine, glycine, serine, carnosine, histidine, glutathione, 3,4_-diaminobenzoic acid, allantoin, glycouril, anthranilic acid, methyl anthranilate, methyl 4-aminobenzoate, ethyl acetoacetate, acetoacetamide, malonamide, ascorbic acid, 1,3-dihydroxyacetone dimer , biuret, oxamide, benzoguanamine, pyroglutamic acid, pyrogallol, methyl gallate, ethyl gallate, gallic acid, propyl, triethanolamine, succinamide, thiabendazole, benzotrifluoride oxazole, triazole, indoline, sulfanilic acid, oxamide, sorbitol, glucose, cellulose, poly (vinyl alcohol), poly (vinyl amine), hexane diol, ethylenediamine -N, N'_ bis acetoacetamide, N- (2_ ethylhexyl) acetoacetamide, N- (3_ phenylpropyl) acetoacetamide, lilial, helional, melonal, triplal (triplal) , 5,5-dimethyl-1,3-cyclohexanedione, 2,4_-dimethyl-3-cyclohexene carbaldehyde, 2,2_-dimethyl-1,3-dioxane 4,6-dione, 2-pentanone, dibutylamine, 亚乙基四胺，苄胺， 羟基香茅醇，环己酮，2-丁酮，戊二酮，脱氢乙酸，壳聚糖，或其混合物。 Ethylene, tetraethylenepentamine, benzylamine, hydroxy citronellol, cyclohexanone, 2-butanone, pentanedione, dehydroacetic acid, chitosan, or mixtures thereof. 优选的甲醛清除剂是亚硫酸氢钠、乙酰乙酸乙酯、乙酰乙酰胺、乙二胺-N，N 双乙酰乙酰胺、抗坏血酸、2，2-二甲基-1，3-二氧己环-4,6-二酮、新洋茉莉醛、女贞醛、铃兰醛、及其混合物。 The preferred formaldehyde scavenger is sodium bisulfite, ethyl acetoacetate, acetoacetamide, ethylenediamine -N, N-bis acetoacetamide, ascorbic acid, 2,2-dimethyl-1,3-dioxane 4,6-dione, helional, triplal, lilial and mixtures thereof. 在洗衣应用中，根据本发明的组合物优选包含一种或多种酶。  in a laundry application, the composition according to the invention preferably comprise one or more enzymes. 当存在于清洁组合物中时，前述酶的存在水平可以是组合物重量的约〇. OOOOlwt%至约2wt%、约0.0 OOlwt%至约lwt%或甚至约0 · OOlwt%至约0 · 5wt%酶蛋白。 When present in the cleaning composition, present at a level the enzyme may be approximately square weight of the composition. OOOOlwt% to about 2wt%, about 0.0 OOlwt% to about lwt%, or even about 0 · OOlwt% to about 0 · 5wt % enzyme protein. 在颗粒具有明显的核和壳的高度优选实施方式中，生产所述颗粒的典型工艺将包括至少一个乳液聚合步骤。 Highly preferred embodiment  having a distinct core and shell particles in the production process of the particles will typically comprise at least one emulsion polymerization step. 对于核基本上包含疏水有益剂的那些实施方式，所述乳液聚合可以采取以下形式:将所述有益剂分散在含水体系中，形成所要求的聚合物壳的适当材料存在于有益剂或所述含水体系中。  For those embodiments comprising a core substantially hydrophobic benefit agent, the emulsion polymerization may take the form: The beneficial agent is dispersed in an aqueous system, the polymer shell is formed of a suitable material is present in the desired beneficial agent or the aqueous system. 然后在有益剂（或有益剂加固定剂或载体）的分散微滴的表面处进行聚合，以形成围绕包含所述有益剂的核的壳。 Then polymerized at the surface of dispersing a beneficial agent (or benefit agents plus fixing agent or carrier) droplets, to form a shell around the core comprising beneficial agent. 这样的方法是公知的，例如以产生氨基塑料香料包封物。 Such methods are well known, for example, to produce aminoplast encapsulates fragrance. 在具有含聚合物核的那些本发明的那些实施方式中，可以在至少两个阶段中发生聚合，其中相继形成壳和核。  In those embodiments of the present invention, those containing the polymer core may be polymerized in at least two stages, wherein the shell and core are formed sequentially. 壳可以在核之后聚合或者聚合次序可以颠倒。 Polymeric or polymeric shell may be reversed after nuclear order. 核在先:在这种方式中，首先形成核，并在核上沉积壳。  Nuclear Priority: In this embodiment, first forming the core, and the shell is deposited on the core. 核在后:在这种方式中，聚合在至少两个阶段中发生。  After the core: In this embodiment, the polymerization occurs in at least two stages. 在这些阶段的前一个，通过逐步增长聚合形成壳。 In one of these stages before, by step-growth polymerization to form the shell. 该壳封闭，并含有用于在后一阶段中发生的链增长反应的反应剂。 The housing is closed, and a reagent comprising a chain reaction occurring in the latter stage. 这些阶段在时间上的分离通过控制反应剂的存在和反应条件来实现。 These phases are separated in time is achieved by the presence of the reactants and the reaction conditions to control. 通常，从初始反应混合物中取出壳形成反应的至少一种组分，并逐步添加以控制壳形成阶段的反应进展。 Typically, the reaction mixture was removed from the initial shell formation reaction of at least one component, and to control the progress of the reaction was added stepwise shell formation stage. 有利地， 反应的第一阶段的在抑制链增长反应的条件下进行。 Advantageously, the first stage reaction is carried out under conditions inhibiting a chain reaction. 这些条件包括足够低的温度(对于热活化反应而言）或者足够低的光的条件(对于光活化反应而言）。 These conditions include a temperature low enough (in terms of the thermal activation reaction) or a sufficiently low light conditions (for the activation reaction in terms of light). 一旦壳形成反应已经充分进行，就改变所述条件(例如通过升高温度或将反应混合物暴露于光）以引起所述反应开始形成内区。 Once the shell has been formed in the reaction sufficiently, the conditions are changed (e.g. by raising the temperature or the reaction mixture is exposed to light) to cause the start of the reaction formed in the region. 优选的方法是其中在不含水的分散相中形成包含链增长聚合物组分的乳液并且所述逐步增长聚合物组分在分散相和连续水相之间的界面处的方法。 A preferred method is a method which comprises forming an emulsion of polymer component and a chain of said step-growth polymer component at the interface between the dispersed phase and a continuous aqueous phase in the non-aqueous dispersed phase. 通常，所述水相包含乳化剂、和逐步增长聚合物的共聚单体之一。  Generally, the aqueous phase comprises an emulsifier, and one comonomer step-growth polymer. 取决于聚合物化学选择，它还可以含有任何二醇、醇或胺交联剂。 Selected depending on the polymer chemistry, it may contain any of a diol, an alcohol or amine crosslinkers. 分散相包含链增长单体、引发剂、任何异氰酸酯或乙烯基交联剂、所述逐步增长聚合物的其它共聚单体以及任何任选的有益剂。 Chain growth phase comprising monomer, initiator, any isocyanate cross-linking agent or a vinyl, a step-growth polymer other comonomer and any optional benefit agent. 所述有益剂可以存在于反应混合物中，其水平要在所生成的颗粒中产生上面所公开的水平的有益剂水平，但是它也可能形成"空"颗粒并随后将它们暴露于可以吸附到颗粒的核中的有益剂。  The benefit agent may be present in the reaction mixture, the level of beneficial agent to the level of the above-disclosed level in the generated particles, but it may also be formed "empty" particles and then exposing them to be adsorbed to the core particles of the beneficial agent. 在接近工艺结束时通常向水相添加表面修饰材料，在此，例如，可以添加其它单体以形成其它壳材料并将另外的材料与颗粒外部结合。  usually added near the end of the process the aqueous surface-modified material, in this case, for example, other monomers may be added to form a shell material and other material in combination with other foreign particles. 对于简单核壳颗粒，除有益剂以外的核优选小于或等于质量的80wt%，并且所述壳通常是颗粒质量的20wt%或更高。  For simple core-shell particles, the core except the beneficial agent is preferably less than or equal to 80wt% by mass, and the mass of the particle shell generally is 20wt% or more. 在优选实施方式中，乳液聚合步骤是所谓的"细乳液"聚合，在分散相微滴尺寸小于一微米下进行。  In a preferred embodiment, the emulsion polymerization step is a so-called "mini-emulsion" polymerization, in the dispersed phase droplet size less than one micron below. 通过一系列方法，包括声处理、和/或借助高剪切动态混合器或静态混合器，可以得到足够细的乳液。 Through a series of methods, including sonication, and / or by means of a high shear dynamic mixer or a static mixer, can be obtained sufficiently fine emulsion. 细乳液产品具有出色的悬浮性质。 Miniemulsion product has excellent suspension properties. 已知许多乳化剂用于乳液聚合。  Many known emulsifiers for emulsion polymerization. 用于所述聚合工艺的合适的乳化剂可以包括但不限于，非离子型表面活性剂例如聚乙烯吡咯烷酮(PVP)、聚乙二醇失水山梨糖醇单月桂酸酯(T Ween20)、聚乙二醇失水山梨糖醇单棕榈酸酯（tWeen40)、聚乙二醇失水山梨糖醇单油酸酯（Tween80)、聚乙稀醇（PVA)、和聚（乙氧基）壬基酸、乙稀马来酸酐（EMA)共聚物、Easy-Sperse™(出自ISP Technologies Inc.)、离子型表面活性剂例如聚丙稀酸的部分中和盐例如聚丙烯酸钠或钾或者聚甲基丙烯酸钠或钾、Bri j™-35、HypermerTMA60、或木质素硫酸钠， 及其混合物。 Suitable emulsifiers for the polymerization process may include, but are not limited to, nonionic surfactants such as polyvinyl pyrrolidone (PVP), polyethylene glycol sorbitan monooleate (T Ween20), poly glycol sorbitan monopalmitate (Tween40), polyethylene glycol sorbitan monooleate (Tween80), polyethylene alcohol (PVA), and poly (ethoxy) nonyl acid, ethylene maleic anhydride (EMA) copolymer, Easy-Sperse ™ (from ISP Technologies Inc.), ionic surfactants such as partially neutralized polyacrylic acid salts such as potassium or sodium polyacrylate or polymethacrylate sodium or potassium, Bri j ™ -35, HypermerTMA60, or lignin sulfate, and mixtures thereof. 乳化剂还可以包括但不限于丙烯酸-丙烯酸烷基酯共聚物、聚(丙烯酸）、聚氧化烯失水山梨糖醇脂肪酯、聚亚烷基共-羧酸酐、聚亚烷基共-马来酸酐、聚（甲基乙烯基醚-共_ 马来酸酐）、聚(丙烯-共-马来酸酐）、聚(丁二烯-共-马来酸酐）、和聚（乙酸乙烯酯-共-马来酸酐）、聚乙烯醇、聚亚烷基二醇、聚氧亚烷基二醇、及其混合物。  Emulsifiers may also include, but are not limited to acrylic acid - alkyl acrylate copolymers, poly (acrylic acid), polyoxyalkylene sorbitan fatty alcohol esters, polyalkylene co - carboxylic acid anhydride, a polyalkylene co - maleic anhydride, poly (methyl vinyl ether - maleic anhydride co _), poly (acrylamide - co - maleic anhydride), poly (butadiene - co - maleic anhydride), and poly (vinyl acetate - co - maleic anhydride), polyvinyl alcohols, polyalkylene glycols, polyoxyalkylene glycols, and mixtures thereof. 优选的乳化剂是脂肪醇乙氧基化物（特别是Bri j™类的）、醚硫酸酯的盐（包括SLES)、烷基和烷芳基磺酸盐和硫酸盐(包括LAS和SDS)和阳离子季盐(包括CTAC和CTAB)。  Preferred emulsifiers are fatty alcohol ethoxylates (especially Bri j ™ and the like), salts of ether sulfate (including the SLES), alkyl and alkylaryl sulfonates and sulfates (including LAS and SDS), and cationic quaternary salts (including CTAC and CTAB). 乳化剂的性质可以选择，以确保完成的颗粒与将要使用它的环境相容。 Properties  The emulsifier may be selected to ensure completion of the particle and its use will be compatible with the environment. 具体地说，在阴离子型表面活性剂体系（例如SLES1-4E0、优选1-3E0和上述的其它)存在下下形成的核与其中环境包含阴离子型表面活性剂的产品相容，所述产品例如身体洗涤产品和洗发剂。  Specifically, the anionic surfactant system (e.g. SLES1-4E0, preferably 1-3E0 and said other) formed in the presence of a nuclear environment in which an anionic surfactant containing products are compatible, the said products such as body wash products and shampoos. 在阳离子型表面活性剂(例如如上所述的阳离子季盐并且具体是烷基三甲基卤化铵之一)存在下形成的核与其中环境包含阳离子型表面活性剂的产品相容，所述产品例如头发调理剂。  cationic surfactants (e.g. cationic quaternary salts as described above and in particular one alkyl trimethyl ammonium halides) in the presence of nuclei formed in the production environment wherein the cationic surfactant comprises a compatible, the products such as hair conditioning agents. 特别优选地，所述乳化剂还包含非离子型表面活性剂。  Particularly preferably, the emulsifier further comprises a nonionic surfactant. 认为这样产生的颗粒比只用带电荷的表面活性剂乳化剂产生的颗粒在皮肤或头发上更好地沉积。 Such that the particles than those produced using only surfactant granules charged emulsifier produced better deposited on the skin or hair. 还优选所述非离子型表面活性剂是亲水的，从而促进形成稳定的细乳液。 Also it preferred that the nonionic hydrophilic surfactant is to promote the formation of fine stable emulsion. 超过十摩尔乙氧基化的醇乙氧基化物，例如Synperonic A20(C1320E0)得到良好的结果。 More than ten times ethoxylated alcohol ethoxylates, for example Synperonic A20 (C1320E0) good results were obtained. 样品的DLS数据显示，随着表面活性剂水平增加，粒度变小，这也是有利的。 DLS data  sample showed that with increasing levels of surfactant, the particle size becomes smaller, which is advantageous. 优选地，非离子与阴离子乳化剂的比率应该大于1:1(即非离子过量存在），并且总表面活性剂水平应该是聚合混合物的>3wt%。  Preferably, the ratio of non-ionic and anionic emulsifiers should be greater than 1: 1 (i.e. excess nonionic), and a total surfactant level of the polymerization mixture should be> 3wt%. 通常助表面活性剂将在聚合期间存在于分散相中并且其一部分将保留在所生成的颗粒中。  The co-surfactant is typically present during the polymerization of the dispersed phase and a portion thereof will remain in the particles generated. 用于本发明的合适的助表面活性剂包括十六烷、鲸蜡醇、过氧化月桂酰、正十二烷硫醇、十二烷基甲基丙烯酸酯、甲基丙烯酸硬脂酸酯、聚苯乙烯、聚癸烯、矿物油、肉豆蔻酸异丙酯、& 3_(：15烷基苯甲酸酯和聚甲基丙烯酸甲酯。 Suitable co-surfactants useful in the present invention include hexadecane, cetyl alcohol, lauroyl peroxide, n-dodecyl mercaptan, dodecyl methacrylate, stearyl methacrylate, poly styrene, polydecene, mineral oil, isopropyl myristate, _ 3 & (: 15 alkyl benzoate, and polymethyl methacrylate. 优选的助表面活性剂包括十六烷、聚癸烯和肉豆蔻酸异丙酯。  Preferred co-surfactants include hexadecyl, polydecene and isopropyl myristate. 取决于存在的反应物，任选的催化剂可以存在于乳液的分散相中。  The reaction was dependent on the presence of an optional catalyst may be present in the dispersed phase of the emulsion. 例如在异氰酸酯/二醇反应中，催化剂可以有利地最小化异氰酸酯水解为伯胺，而伯胺可以与其它异氰酸酯反应形成聚脲。 For example, in an isocyanate / diol reaction, a catalyst may be advantageously minimized hydrolysis of the isocyanate is a primary amine, the primary amine may react with other isocyanate form a polyurea. 这种不希望有的反应可导致在工艺结束时留有过剩的二醇，这可能潜在引起恶臭的形成并妨碍交联反应。 This can result in undesired reactions of excess diol left at the end of the process, which can potentially cause malodor formation and prevent the crosslinking reaction. 合适的催化剂可以包括氨基或有机金属化合物，例如N，N'_二甲基氨基乙醇、N， Ν'-二甲基环己胺、双-(2-二甲基氨基乙基)醚、N，N'_二甲基乙酰胺、二氨基二环辛烷、辛酸亚锡和二月桂酸二丁锡、1，3-双(二甲基氨基)丁烷、五甲基二亚乙基三胺、及其混合物。  Suitable catalyst may comprise an amino group or an organic metal compound, for example N, N'_ dimethylaminoethanol, N, Ν'- dimethyl cyclohexylamine, bis - (2-dimethylaminoethyl) ether, N, N'_ dimethylacetamide, diamino bicyclooctane, stannous octoate and dibutyltin dilaurate, 1,3-bis (dimethylamino) butane, pentamethyldiethylenetriamine diethylene triamine, and mixtures thereof. 当需要时，催化剂的水平通常相对于链增长单体为0.1-2%。  When desired, generally horizontal with respect to the chain growth catalyst is 0.1-2% monomer. 如上所述，聚合可以在至少两个阶段中发生。  As described above, the polymerization can occur in at least two stages. 在一种方法中，在前一阶段期间通过反应形成壳，所述反应在优选实施方式中发生在低于约60摄氏度、通常15-55摄氏度下。 In one method, a shell is formed by the reaction during the previous stage, the reaction occurs in less than about 60 degrees C. In a preferred embodiment, typically 15-55 degrees Celsius. 在后一阶段中，核在超过约70摄氏度、通常70-95摄氏度的优选温度下聚合。 At a later stage, the core in excess of about 70 degrees Celsius, preferably the polymerization temperature is usually 70-95 ° C. 为了基本完成聚合，让这两种反应进行足够长，每个阶段通常1-3小时。 In order to substantially complete the polymerization, so that these two reactions sufficiently long, typically 1 to 3 hours for each stage. 当例如还添加其它壳形成材料(例如其它异氰酸酯和共聚单体），以通过形成捕获一部分沉积助剂并产生"毛"颗粒(其中所述"毛"包含所述沉积助剂)的进一步的壳材料，而将沉积助剂与颗粒外表面结合时，通常在壳形成结束时或接近结束时添加沉积助剂。  When, for example, further adding other shell-forming material (e.g., isocyanates and other comonomers), by forming a portion of the deposition aid and generates captured "hair" particles (wherein the "hair" comprises the deposition aid) is further when the shell material, and the outer surface of the particle deposition aid binding, deposition aids are usually added at or near the end of the end of shell formation. 在可替代方案中，可以基本上完全形成颗粒并通过化学键连接沉积助剂。 In the alternative, the particles may be substantially completely formed and connected by chemical bonds deposition aid. 在本发明的一种实施方式中，颗粒的核包含橡胶状的聚合材料，即其具有的Tg使得它在储存条件下呈橡胶状的聚合材料。  In one embodiment of the present invention, the core particles comprise a rubber-like polymeric material, i.e. having a Tg such that it was rubber-like polymeric material under storage conditions. 用于形成具有这种性质的核的合适的材料是C2-C30、优选C3-C18、更优选C3-C12酰化物或甲基丙烯酸酯类，特别优选的是丁基和甲基衍生物。 Suitable materials for forming the core of this nature is C2-C30, preferably C3-C18, more preferably C3-C12 acylates or methacrylates, particularly preferred are methyl and butyl derivatives. 所述核意图是所述有益剂的良好溶剂。 The core benefit agent is intended that the good solvent. 优选颗粒的壳是玻璃状材料，即其具有的Tg使得它在储存条件下是玻璃状的材料。  Preferably, the particles are glassy shell material, i.e. having a Tg such that the glassy material which is under storage conditions. 用于形成具有这种性质的壳的合适的材料包括甲基丙烯酸甲酯类。 Suitable materials for forming a shell having such properties include methyl methacrylate. 所述壳意图是所述有益剂的动力学屏障以及保持囊完整性。 The shell is intended that the kinetic barrier and to maintain the beneficial agent bladder integrity. 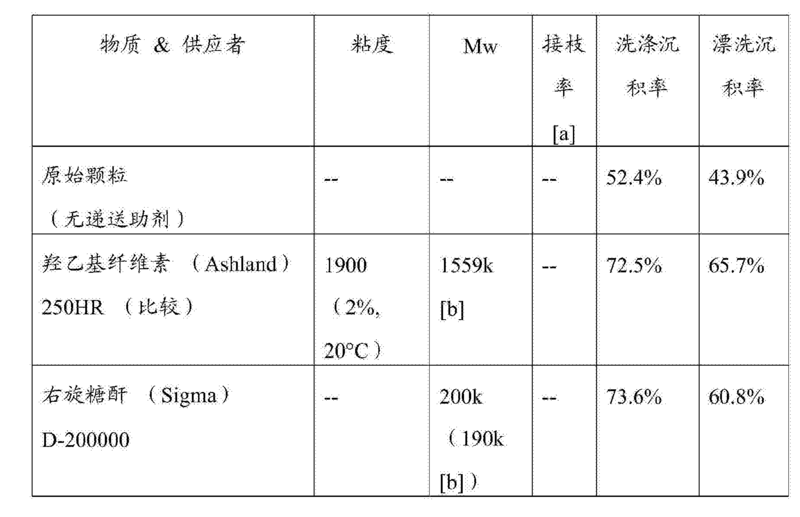 通常所述壳厚l〇-l〇〇nm，优选20-40nm。 Typically the shell thickness l〇-l〇〇nm, preferably 20-40nm. 所述颗粒通常以总组合物的0.001重量%至10重量％、优选0.005重量%至5重量％、最优选0.01重量%至3重量%的水平包含在组合物中。 The  particles is generally 0.001% by weight of the total composition to 10 wt%, preferably 0.005 wt% to 5 wt%, 3 wt% to 0.01 wt%, most preferably included in the composition in levels. 本发明的连接递送助剂的颗粒可以掺入洗衣组合物中。  Connection of the present invention can be incorporated into a delivery aid particles laundry compositions. 这可以通过将浆液/分散体产物与所述组合物的一部分或所有其它组分进行混合来进行，对于粉末优选通过喷洒在所述组分上。 This can be done by mixing a portion of the slurry / dispersion of the product with the composition, or all the other components, preferably for powder by spraying onto the component. 有利地，所述浆液/分散体不需要彻底干燥(如果要干燥的话)并且这样减少有益剂损失。 Advantageously, the slurry / dispersion need not completely dried (if it to be dried) and this reduces the loss of beneficial agent. 用于这些洗衣组合物的组合物中的活性成分优选是表面活性剂或织物调理剂。  These compositions for laundry compositions the active ingredient is preferably a surfactant or fabric conditioner. 可以包含超过一种活性成分。 It may comprise more than one active ingredient. 对于一些应用而言，可以使用活性成分的混合物。 For some applications, a mixture of active ingredients may be used. 本发明的组合物可以是任何物理形态，例如固体如粉末或颗粒、片剂、固体棒、糊剂、凝胶或液体，尤其是水基液体。 The composition  of the present invention may be in any physical form, for example a solid such as a powder or granules, a tablet, a solid bar, a paste, gel or liquid, especially water-based liquid. 具体地，所述组合物可以用于洗衣组合物，特别是液体、 粉末或片剂洗衣组合物。 In particular, the composition may be used in laundry compositions, especially in liquid, powder or tablet laundry composition. 液体是尤其优选的，因为沉积助剂的水解和酶攻击问题在液体组合物中更显著。 Liquids are particularly preferred, because the deposition aid hydrolysis and enzymatic attack problems more pronounced in a liquid composition. 所述洗衣组合物，尤其是主洗涤（织物洗涤）组合物或漂洗添加的软化组合物。  The laundry compositions, especially main wash (fabric washing) compositions or rinse added softening compositions. 所述主洗涤组合物可以包括织物软化剂，并且漂洗添加的织物软化组合物可以包括表面活性化合物，尤其非离子型表面活性化合物。 The main wash compositions may include a fabric softening agent and rinse-added fabric softening compositions may include surface-active compounds, particularly non-ionic surface-active compounds. 优选本发明的洗衣组合物包含一种或多种酶。  The laundry compositions of the invention preferably comprise one or more enzymes. 当存在于组合物中时，前述酶的存在水平可以是组合物重量的约0.00001»〖％至约2¥〖％、约0.0001¥〖％至约1¥〖％或甚至约0.0 Olwt%至约0.5wt%酶蛋白。 When present in the composition, present at a level the enzyme may be about 0.00001 weight of the composition »[% to about 2 ¥ [%, about from 0.0001 ¥ [% to about 1 ¥ [% or even from about 0.0 Olwt% to about 0.5wt% enzyme protein. c)酶，选自纤维素酶、甘露聚糖酶及其混合物。  c) an enzyme selected from a cellulase, mannanase, and mixtures thereof. 特别优选本发明的组合物是头发处理组合物，并且具体是洗发剂组合物和/或头发调理组合物。  In particular preferred compositions of the present invention is a hair treatment composition, and in particular a shampoo composition and / or hair conditioning composition. 如上所述，优选的递送的有益剂是香精、增湿剂、防晒剂、皮肤美白剂、抗微生物剂(特别是抗头肩剂）、油、驱虫剂、颜色保护剂和染料中的一种或多种。 As described above, the preferred benefit agent is perfume delivery, moisturizers, sunscreens, skin lighteners, anti-microbial agents (particularly anti-head and shoulders agent), an oil, repellents, color protection agents and dyes in a or more. 虽然适合用于头发处理组合物中的表面活性剂在下面进一步详细描述，但特别优选的头发处理(洗发剂)组合物包含3-18wt%烷基醚硫酸盐、1-4%两性离子或两性表面活性剂和0.1 -5%无机盐的溶液。  Although surfactants suitable for use in the hair treatment composition is described in further detail below, particularly preferred hair treatment (shampoo) compositions comprising 3-18wt% alkyl ether sulphate, 1-4% zwitterionic or amphoteric surfactant and 0.1 to 5% solution of an inorganic salt. b)至少一种阴离子或非离子型表面活性剂。  b) at least one anionic or non-ionic surfactants. 头发调理组合物是特别优选的，因为本发明的组合物的含有益剂的颗粒在头发的远侧区产生特别好的的沉积，而没有所述沉积助剂的可比较组合物在该区产生差的沉积。  The hair conditioning composition is particularly preferred, because the particles comprising benefit agent composition of the present invention produces particularly good deposition in the distal region of hair, and no comparable composition of the deposition aid in generating a difference deposition area. 本发明的最终产品组合物可以是任何物理形态，例如固体棒、糊剂、凝胶或液体， 或特别是水基液体。 The final product composition  of the present invention may be in any physical form, for example a solid stick, paste, gel or liquid, especially water-based or liquid. 所述颗粒通常以总组合物的0.001重量％至10重量％、优选0.005重量％至7.55重量％、最优选〇. 01重量%至5重量%的水平包含在所述组合物中。  The particles generally 0.001% by weight of the total composition to 10 wt%, preferably 0.005 wt% to 7.55 wt%, most preferably square. 5 wt% to 01 wt% of the level contained in the composition. 取决于最终用途，本发明的组合物通常将含有一种或多种表面活性剂(可以是阴离子、阳离子、非离子、两性离子和两性型的）、表面活性剂和/或非表面活性剂调理剂、脂肪醇、悬浮剂和增稠剂、聚合物、硅氧烷和遮蔽剂。  depends on the end use of the composition of the present invention will typically contain one or more surfactants (which may be anionic, cationic, nonionic, zwitterionic and amphoteric) surfactant and / or surface conditioning agents active agents, fatty alcohols, suspending agents and thickening agents, polymers, and silicone screening agents. 本发明的颗粒可以有利地掺入特别是用于头发或洗衣处理的含表面活性剂的组合物中。  particles of the invention may advantageously be incorporated into compositions for particular hair or laundry treatment comprising a surface active agent. 包含本发明的颗粒的配制的组合物可以含有表面活性化合物(表面活性剂），所述表面活性化合物可以选自皂和非皂阴离子、阳离子、非离子、两性和两性离子型表面活性化合物及其混合物。  The compositions of the present invention comprising formulating particles may contain surface-active compounds (surfactants), the surface-active compound may be selected soap and non-soap anionic, cationic, nonionic, amphoteric and zwitterionic surfactants compounds and mixtures thereof. 许多合适的表面活性化合物是现有的，并且在文献中充分描述，例如在Schwartz、Perry and Berch的〃Surface-Active Agents and Detergents"，I和II册中。可以使用的优选表面活性化合物是皂和合成的非皂阴离子、和非离子化合物。 Many suitable surface-active compounds are available and fully described in the literature, for example, preferably surface-active compounds may be used in Schwartz, Perry and Berch in 〃Surface-Active Agents and Detergents ", I and II brochure soap and synthetic non-soap anionic and nonionic compounds. 用于洗衣组合物的合适的阴离子型表面活性剂是本领域技术人员公知的。  Suitable anionic surfactants in laundry compositions are known to those skilled in the art. 例子包括伯和仲烷基硫酸盐，特别是C8至Cl8伯烷基硫酸盐;烷基酿硫酸盐;稀经横酸盐;烷基^甲苯磺酸盐;二烷基磺基琥珀酸盐;和脂肪酸酯磺酸盐。 Examples include primary and secondary alkyl sulphates, particularly C8 to Cl8 primary alkyl sulfates; alkyl sulfates brewing; dilute acid through the cross; ^ alkyl tosylate; dialkyl sulfosuccinates; and fatty acid ester sulphonates. 通常优选钠盐。 Sodium is generally preferred. 烷基硫酸钠由于它们的低成本，通常占存在于洗衣组合物中的阴离子型表面活性剂的大部分。 Most anionic surfactants alkyl sulfate due to their low cost, generally comprise the laundry present in the composition. 对于头发处理组合物而言，合适的阴离子清洁表面活性剂的例子是烷基硫酸盐、 烷基醚硫酸盐、烷芳基磺酸盐、烷酰基羟乙基磺酸盐、烷基琥珀酸盐、烷基磺基琥珀酸盐、烷基醚磺基琥珀酸盐、N-烷基肌氨酸盐、烷基磷酸盐、烷基醚磷酸盐、和烷基醚羧酸及其盐，尤其它们的钠、镁、铵和单_、二-和三乙醇胺盐。  For hair treatment compositions, examples of suitable anionic cleansing surfactants are the alkyl sulfates, alkyl ether sulphates, alkaryl sulphonates, alkanoyl isethionates, alkyl succinates, alkyl sulfosuccinates, alkyl ether sulphosuccinates, N- alkyl sarcosinates, alkyl phosphates, alkyl ether phosphates, and alkyl ether carboxylic acids and salts thereof especially their sodium, magnesium, ammonium, and mono- _, di - and triethanolamine salts. 用于皮肤和头发组合物的表面活性剂掺合物通常比用于洗衣组合物中的更温和。 Hair and skin compositions for the blend of surfactants is generally milder than a laundry composition used. 所述烷基和酰基通常含有8至18、优选10至16个碳原子并且可以是不饱和的。  The alkyl and acyl groups generally contain from 8 to 18, preferably 10 to 16 carbon atoms and may be unsaturated. 所述烷基醚硫酸盐、烷基醚磺基琥珀酸盐、烷基醚磷酸盐和烷基醚羧酸及其盐可以每分子含有1 至20个氧化乙烯或氧化丙烯单元。 The alkyl ether sulfates, alkyl ether sulfosuccinates, alkyl ether phosphates and alkyl ether carboxylic acids and salts thereof may contain per molecule from 1 to 20 ethylene oxide or propylene oxide units. 用于本发明洗发剂组合物中的典型阴离子型清洁表面活性剂包括油烯基琥珀酸钠、月桂基磺基琥珀酸铵、月桂基硫酸钠、月桂基醚硫酸钠、月桂基醚磺基琥珀酸钠、月桂基硫酸铵、月桂基醚硫酸铵、十二烷基苯磺酸钠、十二烷基苯磺酸三乙醇胺、椰油酰基羟乙基磺酸钠、月桂基羟乙基磺酸钠、月桂基醚羧酸和N-月桂基肌氨酸钠。  Typical anionic cleansing surfactants for shampoo compositions of the present invention include sodium oleyl succinate, ammonium lauryl sulfosuccinate, sodium lauryl sulfate, lauryl ether sulfate, sodium lauryl ether sodium sulfosuccinate, ammonium lauryl sulfate, ammonium lauryl ether sulphate, sodium dodecylbenzene sulfonate, triethanolamine dodecylbenzene sulfonate, sodium cocoyl isethionate, lauryl hydroxyethyl ethyl sulfonate, sodium lauryl ether carboxylic acid and sodium N- lauryl sarcosinate. 用于头发处理组合物中的优选的阴离子型表面活性剂是烷基硫酸盐和烷基醚硫酸盐。 Anionic surfactants  Preferred hair treatment compositions are alkyl sulfates and alkyl ether sulfates. 这些材料分别具有式R20S0 3M和R^G^OhSOsM，其中R2是8至18个碳原子的烷基或烯基，X是具有约1至约10的值的整数，和Μ是阳离子如铵、烷醇胺如三乙醇胺、单价金属如钠和钾、和多价金属阳离子如镁和钙。 These materials have the respective formulas R20S0 3M and R ^ G ^ OhSOsM, wherein R2 is an alkyl group from 8 to 18 carbon atoms or an alkenyl group, X is an integer having a value from about 1 to about 10, and Μ is a cation such as ammonium, alkanolamines such as triethanolamine, monovalent metals such as sodium and potassium, and polyvalent metal cations such as magnesium and calcium. 对于头发组合物而言，最优选R 2具有12至14个碳原子，并以直链而不是支链。 For hair compositions, most preferably R 2 having from 12 to 14 carbon atoms, and straight chain rather than branched. 用于头发处理组合物中的优选的阴离子型表面活性剂选自月桂基硫酸钠和月桂基醚硫酸钠(η)ΕΟ,（其中η是1至3);更优选月桂基醚硫酸钠(η)Ε0,（其中η是1至3);最优选月桂基醚硫酸钠(η)Ε0，其中η=1。 Anionic surfactants  Preferred hair treatment composition is selected from sodium lauryl sulfate and sodium lauryl ether sulfate (η) ΕΟ, (where [eta] is 1 to 3); more preferably, sodium lauryl ether sulfate sodium (η) Ε0, (where [eta] is 1 to 3); and most preferably sodium lauryl ether sulfate (η) Ε0, where η = 1. 优选烷基醚硫酸盐在本发明的头发处理组合物中的水平是总组合物的0.5wt%至25wt%，更优选3wt%至18wt%，最优选总组合物的6wt%至15wt%。  Preferred alkyl ether sulphates in the horizontal hair treatment composition of the present invention is 0.5wt% to 25wt% of the total composition, more preferably from 3wt% to 18wt%, 6wt% of the total composition and most preferably to 15wt %. 本发明的头发处理(洗发剂)组合物中阴离子型清洁表面活性剂的总量范围通常是0 · 5wt% 至45wt%、更优选1 · 5wt% 至20wt%。  the total amount of hair treatment range (shampoo) compositions anionic cleansing surfactants of the present invention is usually 0 · 5wt% to 45wt%, more preferably from 1 · 5wt% to 20wt%. 本发明的组合物可以含有非离子型表面活性剂。  The compositions of the present invention may contain a nonionic surfactant. 可以使用的非离子型表面活性剂包括伯和仲醇乙氧基化物，尤其是每摩尔醇用平均1至20摩尔氧化乙烯乙氧基化的C8至C20 脂族醇，更尤其是每摩尔醇用平均1至10摩尔氧化乙烯乙氧基化的C10至C15伯和仲脂族醇。 Nonionic surfactants that may be used include the primary and secondary alcohol ethoxylates, especially per mole of alcohol with an average of from 1 to 20 moles of ethylene oxide ethoxylated C8 to C20 aliphatic alcohols, and more particularly per mole of alcohol ethylene oxide ethoxylated with an average of 1 to 10 moles C10 to C15 primary and secondary aliphatic alcohols. 非乙氧基化的非离子型表面活性剂包括烷基聚葡萄糖苷、甘油单醚、和聚羟基酰胺(葡糖酰胺)。 Non-ethoxylated nonionic surfactants include alkyl poly glucoside, glycerol monoethers, and polyhydroxy amides (glucamide). 优选非离子型表面活性剂的水平是包含本发明的颗粒的完全配制的洗衣组合物重量的〇wt%至30wt%，优选lwt%至25wt%，最优选2wt%至15wt%。  Preferably the level of nonionic surfactants comprising fully formulated laundry composition weight of the particles of the present invention 〇wt% to 30wt%, preferably LWT% to 25wt%, most preferably 2wt% to 15wt%. 本发明的头发处理组合物可以含有非离子型表面活性剂。  Hair treatment compositions according to the present invention may contain a nonionic surfactant. 最优选非离子型表面活性剂在头发处理组合物中的存在范围是0至5wt%。 In the hair treatment composition most preferably is present in a non-ionic surfactant is from 0 to 5wt%. 可以包含在本发明的头发处理组合物中的非离子型表面活性剂包括脂族（C8-C18)伯或仲直链或支链醇或苯酚与烯化氧、通常氧化乙烯的缩合产物并通常具有6至30个氧化乙烯基团。  may comprise a condensation hair treatment composition according to the present invention is nonionic surfactants include aliphatic (C8-C18) primary or secondary linear or branched chain alcohols or phenols with alkylene oxides, usually ethylene oxide The product and generally having from 6 to 30 ethylene oxide groups. 特别优选烷基乙氧基化物。 Particularly preferred alkyl ethoxylates. 最优选具有式R-(0CH2CH2)n0H的烷基乙氧基化物，其中R是C12至C15的烷基链，并且η是5至9。 Most preferably having the formula R- (0CH2CH2) n0H alkyl ethoxylate wherein R is an alkyl chain of C12 to C15, and η is 5-9. 用于头发处理组合物中的其它合适的非离子型表面活性剂包括单或二烷基烷醇酰胺。  Other suitable nonionic surfactants hair treatment composition include mono- or dialkyl alkanolamides. 例子包括椰油基单-或二-乙醇酰胺和椰油基单异丙醇酰胺。 Examples include coco mono - or di - ethanolamide and coco monoisopropanolamide. 其中R是可以饱和或不饱和的支链或直链烷基，和G是糖基。  wherein a branched or straight chain alkyl R is a saturated or unsaturated, and G is a saccharide group. R可以表示从约C5至约C20的平均烷基链长度。  R may represent a mean alkyl chain from about C5 to about C20 in length. 优选R表示从约C8至约C12的平均烷基链长度。 Preferably R represents a mean alkyl chain from about C8 to about C12 in length. 最优选R的值介于约9.5和约10.5之间。 Most preferably the value of R is between about 9.5 and about 10.5. 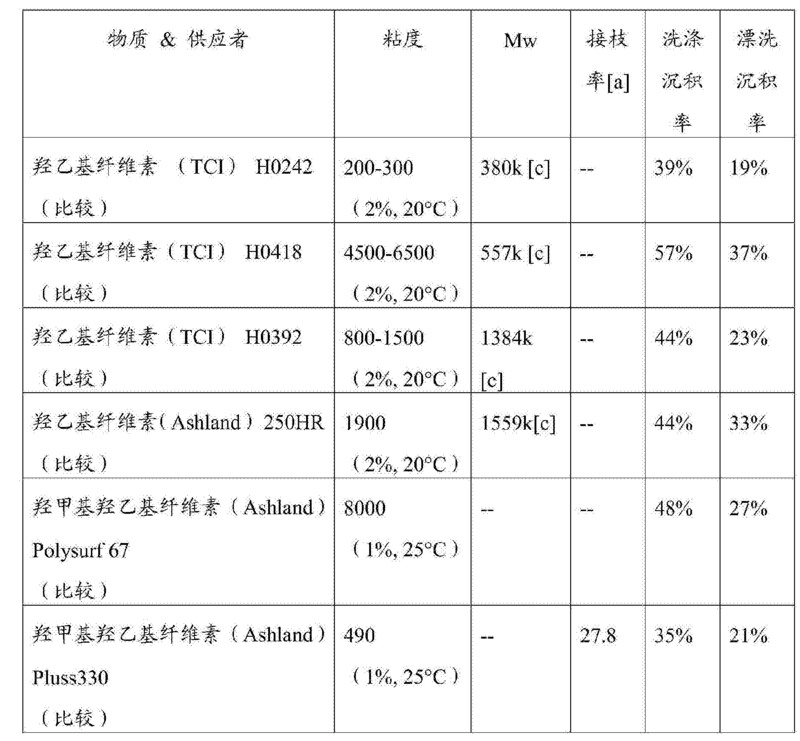 G可以选自C5或C6单糖残基，并且优选是葡糖苷。 G may be selected from C5 or C6 monosaccharide residues, and is preferably a glucoside. G可以选自葡萄糖、木糖、乳糖、果糖、甘露糖及其衍生物。 G may be selected from glucose, xylose, lactose, fructose, mannose and derivatives thereof. 优选G是葡萄糖。 Preferably G is glucose. [0171 ] 所述APG的聚合度η可以具有约1至约10或更大的值。  The degree of polymerization of the APG η may have from about 1 to about 10 or greater value. 优选地，η的值介于约1.1至约2。 Preferably, the value of η is between about 1.1 to about 2. 最优选η的值介于约1.3至约1.5。 The most preferred values ​​of η ranging from about 1.3 to about 1.5. 可包含在本发明组合物中的其他糖衍生的非离子型表面活性剂包括C10-C18N-烷基(C1-C6)多羟基脂肪酸酰胺，例如C12-C18N-甲基葡糖酰胺，如例如W092 06154和US5 194 639中所述，和N-烷氧基多羟基脂肪酸酰胺，例如C10-C18N-(3-甲氧基丙基)葡糖酰胺。 Nonionic surfactant  may be included in compositions of the present invention includes other sugar-derived C10-C18N- alkyl (C1-C6) polyhydroxy fatty acid amides, such as C12-C18N- methyl glucamide, the W092 06154 US5 194 639 and in the example, and N- alkoxy polyhydroxy fatty acid amides, such as C10-C18N- (3- methoxypropyl) glucamide. 两性或两性离子表面活性剂的包含量可以是本发明的组合物、特别是头发处理组合物的0.5wt%至约8wt%，优选lwt%至4wt%。  comprising an amount of amphoteric or zwitterionic surfactants may be a combination of the present invention, in particular 0.5wt% to about 8wt% of the hair treatment composition, preferably from lwt% to 4wt%. 两性或两性离子型表面活性剂的例子包括烷基胺氧化物、烷基甜菜碱、烷基酰胺基丙基甜菜碱、烷基磺基甜菜碱(磺基甜菜碱）、烷基甘氨酸盐、烷基羧基甘氨酸盐、烷基两性乙酸盐、烷基两性丙酸盐、烷基两性甘氨酸盐、烷基酰胺基丙基羟基磺基甜菜碱、酰基牛磺酸盐和酰基谷氨酸盐，其中所述烷基和酰基具有8至19个碳原子。 Examples include alkyl amine oxides  amphoteric or zwitterionic surfactants, alkyl betaines, alkyl amidopropyl betaines, alkyl sulfobetaines (sultaines), alkyl glycine salts, alkyl carboxyglycinates, alkyl amphoacetates, alkyl amphopropionates, alkyl amphoglycinates, alkyl amidopropyl hydroxyl sultaine, acyl taurates and acyl glutamates salt, wherein the alkyl and acyl groups have from 8 to 19 carbon atoms. 用于本发明的头发处理组合物中的典型两性和两性离子型表面活性剂包括月桂基胺氧化物、椰油酰二甲基磺丙基甜菜碱、月桂基甜菜碱、椰油酰胺基丙基甜菜碱和椰油酰两性乙酸钠。 Typical amphoteric and zwitterionic surfactants hair treatment composition according to the present invention include lauryl amine oxide, coconut acid dimethyl sulfopropyl betaine, lauryl betaine, cocamidopropyl betaine and sodium acetate cocoamphodiacetate. 特别优选的两性或两性离子型表面活性剂是椰油酰胺丙基甜菜碱。  A particularly preferred amphoteric or zwitterionic surfactant is cocamidopropyl betaine. 任何上述两性或两性离子型表面活性剂的混合物也可能是合适的。  mixtures of any of the amphoteric or zwitterionic surfactants may also be suitable. 优选的混合物是椰油酰胺基丙基甜菜碱与如上所述的其它两性或两性离子型表面活性剂的那些。 Preferred mixtures are those of cocamidopropyl betaine with further amphoteric or zwitterionic surfactants as described above. 优选的其它两性或两性离子型表面活性剂是椰油酰两性乙酸钠。 Preferred further amphoteric or zwitterionic surfactant is sodium acetate cocoamphodiacetate. 本发明的头发处理或洗衣用途组合物可以是所谓的调理剂，并通常含有调理表面活性剂。  the present invention, the hair treatment compositions or laundry applications may be a so-called conditioning agents, and typically contain conditioning surfactants. 头发调理剂组合物通常将包含美容可接受的并且适合于局部应用于头发的一种或多种调理表面活性剂。 Hair conditioner compositions will typically comprise a cosmetically acceptable and suitable for topical application to the hair one or more conditioning surfactants. 合适的调理表面活性剂包括选自阳离子型表面活性剂的那些，单独或以混合物使用。  Suitable conditioning surfactants include those selected from cationic surfactants are those, alone or in a mixture. 优选地，所述阳离子型表面活性剂具有式N+R1!^3! ?4，其中R 1、R2、R3和R4独立地是（(^至C30)烷基或苄基。优选地，R\R2、R3和R4中的一个、两个或三个独立地是(C 4至C3Q)烷基并且其他R\R2、R3和R 4基团是(Q-C6)烷基或苄基。更优选地，R\R2、R3和R4中的一个或两个独立地是(C 6至C3Q)烷基并且其他R\R2、R3和R4基团是(&-C6)烷基或苄基。任选地，所述烷基可以在烷基链内包含一个或多个酯(-0C0-或-C00-)和/或醚(-0-)键。烷基可以任选被一个或多个羟基取代。烷基可以是直链或支链的，并且对于具有3个或更多个碳原子的烷基而言，可以是环状的。所述烷基可以是饱和的或可以含有一个或多个碳-碳双键(例如油烯基）。烷基任选在烷基链上被一个或多个乙烯氧基乙氧基化。 Preferably, the cationic surfactants have the formula N + R1! ^ 3!? 4, wherein R 1, R2, R3 and R4 are independently ((^ to C30) alkyl or benzyl group. Preferably, R \ R2, R3, and R4 are one, two or three independently (C 4 to C3Q) alkyl and the other R \ R2, R3, and R 4 groups are (Q-C6) alkyl or benzyl. more preferably, R \ R2, R3 and R4 are independently one or two (C 6 to C3Q) alkyl and the other R \ R2, R3, and R4 groups are (& -C6) alkyl or benzyl group optionally, the alkyl groups may comprise one or more ester (-0C0- or -C00-) in the alkyl chain and / or ether (-0-) bonds. may be optionally substituted with one or more alkyl hydroxyl group. the alkyl group may be linear or branched, and for having 3 or more carbon atoms in the alkyl group, it may be cyclic. the alkyl group may be saturated or may contain one or more carbon - carbon double bonds (e.g., oleyl) alkyl is optionally substituted with one or more ethyleneoxy groups on the alkyl chain ethoxylated. 用于本发明调理剂组合物中的合适的阳离子型表面活性剂包括鲸蜡基三甲基氯化铵、山嵛基三甲基氯化铵、鲸蜡基氯化吡啶鑰、四甲基氯化铵、四乙基氯化铵、辛基三甲基氯化铵、十二烷基三甲基氯化铵、十六烷基三甲基氯化铵、辛基二甲基苄基氯化铵、癸基二甲基苄基氯化铵、硬脂基二甲基苄基氯化铵、双十二烷基二甲基氯化铵、双十八烷基二甲基氯化铵、牛脂基三甲基氯化铵、二氢化牛脂基二甲基氯化铵(例如Arquad2HT/75，出自Akzo Nobe 1 )、椰油基三甲基氯化铵、PEG-2-油基氯化铵及其相应的氢氧化物。  Suitable cationic surfactants conditioner compositions of the present invention include cetyl trimethyl ammonium chloride, behenyl trimethyl ammonium chloride, cetyl pyridinium chloride key, tetrakis chloride, tetraethylammonium chloride, octyl trimethyl ammonium, dodecyl trimethyl ammonium chloride, cetyl trimethyl ammonium chloride, octyl dimethyl benzyl ammonium chloride, decyl dimethyl benzyl ammonium chloride, stearyl dimethyl benzyl ammonium chloride, didodecyl dimethyl ammonium chloride, dioctadecyl dimethyl dichloride ammonium, tallow trimethyl ammonium chloride, di tallow dimethyl ammonium chloride (e.g. Arquad2HT / 75, from Akzo Nobe 1), coco trimethyl ammonium chloride, PEG-2- oleyl-chloro ammonium and the corresponding hydroxides. 其它合适的阳离子型表面活性剂包括CTFA名称为季铵盐(Quaternium)-5、季铵盐-31和季铵盐-18的那些材料。 Other suitable cationic surfactants include quaternary ammonium salt CTFA name (Quaternium) -5, -31 and those materials quaternium-18 of a quaternary ammonium salt. 任何上述材料的混合物也可能是合适的。 Mixtures of any of the foregoing materials may also be suitable. 用于本发明调理剂中的特别有用的阳离子型表面活性剂是鲸蜡基三甲基氯化铵，商业上可作为例如GENAMIN CTAC得到，出自Hoechst Celanese。 A particularly useful cationic surfactant for use in conditioners of the invention is cetyltrimethylammonium chloride, available commercially for example as GENAMIN CTAC obtained from Hoechst Celanese. 用于本发明调理剂中的另一种特别有用的阳离子型表面活性剂是山嵛基三甲基氯化铵，商业上可作为例如GENAMIN KDMP得到，出自CLARIANT。 Another particularly useful for cationic surfactants in conditioners of the invention is behenyltrimethylammonium chloride, available commercially for example as GENAMIN KDMP obtained from CLARIANT. [0189 ]在本文中使用时，术语烃基链是指烷基或烯基链。  As used herein, the term hydrocarbyl chain means an alkyl or alkenyl chain. R2和R3各自独立地是烃基残基，优选烷基，具有1至约4个碳原子，并且m是1至约4的整数。  R2 and R3 are each independently hydrocarbyl residues, preferably alkyl groups having 1 to about 4 carbon atoms, and m is an integer from 1 to about 4. 优选地，R2和R3是甲基或乙基。  Preferably, R2 and R3 are methyl or ethyl. 优选地，m是2或3,即亚乙基或亚丙基。  Preferably, m is 2 or 3, i.e. an ethylene or propylene group. 在此有用的优选酰胺基胺包括硬脂酰胺丙基二甲胺、硬脂酰胺丙基二乙胺、硬脂酰胺乙基二乙胺、硬脂酰胺乙基二甲胺、棕榈酰胺丙基二甲胺、棕榈酰胺丙基二乙胺、棕榈酰胺乙基二乙胺、棕榈酰胺乙基二甲胺、山嵛酰胺丙基二甲胺、山嵛酰胺丙基二乙胺、山嵛酰胺乙基二乙胺、山嵛酰胺乙基二甲胺、花生酰胺丙基二甲胺、花生酰胺丙基二乙胺、花生酰胺乙基二乙胺、花生酰胺乙基二甲胺、及其混合物。  In preferred useful herein include stearyl amido amine dimethylamine, diethylamine propyl stearamide, stearamide ethyl diethylamine, dimethylamine ethyl stearamide, palmitamide dimethylamine, diethylamine palmitic amide propyl, palmitamide ethyl diethylamine, ethyl dimethylamine palmitic amide, behenic dimethylamine, diethylamine propyl behenic amide, behenic diethylamine ethyl amide, behenic acid amide ethyldimethylamine, peanut dimethylamine, diethylamine amidopropyl peanuts, peanut ethyl amide diethylamine, ethyl dimethylamine amide peanut, and mixture. 在此有用的特别优选的酰胺基胺是硬脂酰胺丙基二甲胺、硬脂酰胺乙基二乙胺、 及其混合物。  In particularly useful herein are preferred amidoamine stearyl dimethylamine, stearamide ethyl diethylamine, and mixtures thereof. 在此有用的可商购酰胺基胺包括:硬脂酰胺丙基二甲胺，商品名LEXAMINE S-13， 可得自Inolex(美国宾夕法尼亚州费城），和AMIDOAMINE MSP，可得自Nikko(日本东京）；硬脂酰胺乙基二乙胺，商品名AMIDOAMINE S，可得自Nikko ;山嵛酰胺丙基二甲胺，商品名INCROMINE BB，可得自Croda(英国North Humberside);以及可得自Scher(美国新泽西州Clifton)的商品名为SCHERC0DINE系列的各种酰胺基胺。  Useful herein are commercially available amido amines include: stearyl dimethylamine tradename LEXAMINE S-13, available from Inolex (Philadelphia, PA), and AMIDOAMINE MSP, available from Nikko (Tokyo, Japan); stearamide ethyl diethylamine, tradename AMIDOAMINE S, available from Nikko; behenic dimethylamine, tradename INCROMINE BB, available from Croda (United Kingdom North Humberside); and a from Scher (New Jersey, Clifton) commodity various amidoamines called SCHERC0DINE series. 可以存在质子化酸。  may be present in its protonated acid. 酸可以是能够将所述调理剂组合物中的酰胺基胺质子化的任何有机或无机酸。 The acid may be capable of the conditioner composition amidoamine protonated any organic or inorganic acid. 在此有用的合适的酸包括盐酸、乙酸、酒石酸、富马酸、乳酸、苹果酸、琥珀酸、及其混合物。 Suitable useful herein include hydrochloric acid, acetic acid, tartaric acid, fumaric acid, lactic acid, malic acid, succinic acid, and mixtures thereof. 优选地，所述酸选自乙酸、酒石酸、盐酸、富马酸、乳酸、及其混合物。 Preferably, the acid is selected from acetic acid, tartaric acid, hydrochloric acid, fumaric acid, lactic acid, and mixtures thereof. 所述酸的主要作用是将头发处理组合物中的酰胺基胺质子化，从而在所述头发处理组合物中原位形成叔胺盐(TAS)。  The primary action of an acid is a hair treatment composition amidoamine protonated, thereby forming a tertiary amine salt in situ (TAS) in the hair treatment composition. 所述TAS实际上是非永久季铵或假季铵阳离子型表面活性剂。 The TAS in effect is a non-permanent quaternary ammonium or pseudo-quaternary ammonium cationic surfactant. 合适地，包含的所述酸的量足以质子化超过95摩尔％(293K)的存在的酰胺基胺。  Suitably, the acid comprises an amount sufficient to protonate the amidoamine present in excess of 95 mol% (293K) is. 在本发明的头发调理剂中，阳离子型表面活性剂的水平通常在所述组合物的0.01 重量%至1〇重量％、更优选〇. 05重量%至7.5重量％、最优选0.1重量%至5重量%的范围内。  In the hair conditioning agents of the present invention, the level of cationic surfactant is generally 0.01 weight% of the composition to 1〇 wt%, and more preferably square. 05 wt.% To 7.5 wt%, most preferably 0.1 wt% range to 5% by weight. 对于洗衣调理剂而言，稀释的产品通常含有最多约8%、优选2至8重量％的软化活性剂，而浓缩产品可以含有约8至约50重量％、优选8至25重量%活性剂。  conditioning agents for laundry, the diluted product generally contains up to about 8%, preferably 2 to 8% by weight of softening active, concentrated products may contain from about 8 to about 50 wt%, preferably 8-25 wt% active agent. 取决于活性剂体系，活性剂超过约25重量%的组合物定义为"超浓缩"，并也旨在被本发明涵盖。 Depending on the surfactant system, the active agent exceeds about 25 wt% of the composition is defined as "super-concentrated", and also intended to be encompassed by the present invention. 所述织物调理剂的用量可以是例如优选所述组合物的2重量%至30重量％、更优选5重量%至25重量%并最优选8 至20重量％。 The amount of the fabric conditioning agent may be, for example, 2 wt% of the composition, preferably to 30 wt%, more preferably from 5 wt% to 25 wt%, and most preferably 8 to 20% by weight. 用于本发明的织物调理剂组合物的织物软化活性剂通常包含酯连接的三乙醇胺季铵化合物(QAC)。 Fabric softening active used in fabric conditioner compositions of the present invention generally comprise triethanolamine quaternary ammonium compound (the QAC) ester-linked. 优选地，QAC源自于棕榈或牛脂原料。  Preferably, QAC palm or tallow derived material. 这些原料可以是纯的或主要是基于棕榈或牛脂的。 These materials may be pure or mainly based on palm or tallow. 可以使用不同原料的掺合物。 Blend may be used of different materials. 按总脂肪酸链的重量计，QAC的脂肪酸链优选包含20至35wt%的饱和C18链和20至35wt%的单不饱和C18链。 By weight of the total fatty acid chains, QAC fatty acid chains preferably comprise 20 to 35wt% saturated C18 chain and 20 to 35wt% monounsaturated C18 chain. 在作为洗衣调理剂的优选实施方式中， 按总脂肪酸链的重量计，QAC的脂肪酸链包含25至30wt%、优选26至28wt%的饱和C18链和25 至30wt%、优选26至28wt%的单不饱和C18链。 In a preferred embodiment as a laundry conditioning agent, by weight of the total fatty acid chains, the QAC fatty chain comprises 25 to 30wt%, preferably 26 to 28wt% saturated C18 chain and 25 to 30wt%, preferably 26 to 28wt% of monounsaturated C18 chain. 在另一种优选实施方式中，按总脂肪酸链的重量计，QAC的脂肪酸链包含30至35wt%、优选33至35wt%的饱和的C18链和24至35wt%、优选27 至32wt%的单不饱和C18链。 In another preferred embodiment, by weight of the total fatty acid chains, the QAC fatty chain comprises 30 to 35wt%, preferably 33 to 35wt% saturated C18 chain and 24 to 35wt%, preferably 27 to 32wt% of a single C18 unsaturated chains. 用于本发明的优选季铵材料可以源自于总碘值为30至45、优选30至42并最优选36的原料。 Preferred quaternary ammonium material used in the present invention may be derived from the total iodine value of 30 to 45, preferably from 30 to 42 and most preferably 36 to feed. 合适的洗衣调理剂的商业例子包括出自Stepan的Stepantex™UL85、出自Clariant 的Prapagen™TQL，和出自Kao的Tetranyl™AHT-l(二者均为甲基硫酸三乙醇铵的二-[硬化牛油酯])，AT-1(甲基硫酸三乙醇铵的二-[牛油酯])，和L5/90(甲基硫酸三乙醇铵的二-[棕榈酯])，二者均出自Kao,和Rewoquat™WE15(具有源自于C10-C20和C16-C18不饱和脂肪酸的脂肪酰基残基的甲基硫酸三乙醇铵的二酯），出自Witco Corporation。  Examples of suitable commercial laundry conditioning agents comprising by Stepan the Stepantex ™ UL85, by Clariant, Prapagen ™ TQL, ex Kao, and the Tetranyl ™ AHT-l (both are triethanolammonium methylsulphate di - [ hardened tallow ester]), AT-1 (triethanolammonium methylsulphate di - [tallow ester]), and L5 / 90 (triethanolammonium methylsulphate di - [palm ester]), both from Kao, and Rewoquat ™ WE15 (having triethanol ammonium methyl sulphate derived from C10-C20 and C16-C18 unsaturated fatty acid fatty acyl residues diesters), from Witco Corporation. 此外，季铵活性剂例如Stepantex VK90、Stepantex VT90、SP88(出自Stepan)、Ceca Noramine、Prapagen TQ(出自Clariant)、Dehyquart AU_57(出自Cognis)、Rewoquat WE18(出自Degussa)以及Tetranyl L190P、Tetranyl L190SP和Tetranyl L190S(全部出自Kao)是合适的。 In addition, quaternary ammonium active agents such as Stepantex VK90, Stepantex VT90, SP88 (from Stepan), Ceca Noramine, Prapagen TQ (from Clariant), Dehyquart AU_57 (from Cognis), Rewoquat WE18 (from Degussa) and Tetranyl L190P, Tetranyl L190SP and Tetranyl L190S (all from Kao) are suitable. 在洗衣调理剂中，存在非离子作为防絮凝剂使得能够形成稠的"稀释"织物调理剂组合物，它在使用时不絮凝。  In the laundry conditioning agents, the presence of a nonionic flocculant such as an anti "diluted" fabric conditioner composition is capable of forming a thick, it does not flocculate during use. 基于椰油基链和25E0基团的Luten S〇l™AT25(BASF)是合适的非离子型表面活性剂的例子。 Based Luten S〇l ™ AT25 coco chain and 25E0 group (BASF) are examples of suitable nonionic surfactants. 其它合适的表面活性剂包括1^116136(1'14(16〇61:11-6)，出自Uniqema; Tergitol 15-S3，出自Dow Chemical Co . ；Dihydrol LT7,出自Thai Ethoxylate ltd;Cremophor C040,出自BASF和Neodol91_8,出自Shell。 Other suitable surfactants include ^ 1 116 136 (1'14 (16〇61: 11-6), from Uniqema; Tergitol 15-S3, from Dow Chemical Co; Dihydrol LT7, by Thai Ethoxylate ltd; Cremophor C040, from. BASF and Neodol91_8, from Shell. 本发明的组合物、尤其头发处理组合物，还可以包含分散的非挥发性的、不溶于水的油性调理剂。 The composition of  the present invention, in particular the hair treatment composition may further contain dispersed non-volatile, water-insoluble oily conditioning agents. 优选这样的非硅氧烷调理性油性调理剂存在于头发调理剂组合物中。 Such a preferred non-silicone oily conditioning agents opsonic hair conditioning agent present in the composition. "不溶"是指所述调理剂不溶于水(蒸馏水或等同物），在25°C时浓度为0.1%(w/w)。  "insoluble" means that the conditioning agent is not soluble in water (distilled or equivalent) at 25 ° C and a concentration of 0.1% (w / w). 合适的油性或脂肪调理剂选自烃油、脂肪酯及其混合物。  Suitable fatty or oily conditioning agents are selected from hydrocarbon oils, fatty esters and mixtures thereof. 直链烃油将优选含有约12至约30个碳原子。 Straight chain hydrocarbon oils will preferably contain from about 12 to about 30 carbon atoms. 烯基单体、例如C2-C6烯基单体的聚合烃也是合适的。 Alkenyl monomers, such as C2-C6 alkenyl polymeric hydrocarbon monomer are also suitable. 合适的烃油的具体例子包括石蜡油、矿物油、饱和和不饱和的十二烷、饱和和不饱和的十三烧、饱和和不饱和的十四烧、饱和和不饱和的十五烧、饱和和不饱和的十六烧、及其混合物。 Specific examples of the  Suitable hydrocarbon oils include paraffin oil, mineral oil, saturated and unsaturated dodecane, saturated and unsaturated tridecane burn, saturated and unsaturated burn fourteen, ten saturated and unsaturated five burned, saturated and unsaturated sixteen burn, and mixtures thereof. 这些化合物的支链异构体、以及更高链长的烃，也可以使用。 Branched chain isomers of these compounds, as well as of higher chain length hydrocarbons, can also be used. 合适的脂肪酯的特征在于具有至少10个碳原子，并且包括具有来源于脂肪酸或醇的烃基链的酯，单羧酸酯包括式R'COOR的醇和/或酸的酯，其中R'和R独立地表示烷基或烯基，并且R'和R中碳原子的总和为至少10,优选至少20。  Suitable fatty esters are characterized by having at least 10 carbon atoms, and include esters derived from fatty acids or alcohols having a hydrocarbon chain, monocarboxylic acid esters of the formula R'COOR including alcohols and / or esters of an acid, wherein R 'and R independently denote alkyl or alkenyl, and R' and the sum of carbon atoms in R is at least 10, preferably at least 20. 羧酸的二和三烷基和烯基酯也可以使用。 Di- and tri-alkyl and alkenyl esters of carboxylic acids can also be used. 特别优选的脂肪酯是甘油单、二、三酯，更具体是甘油与长链羧酸例如C1-C22羧酸的单、二、和三酯。  Particularly preferred fatty esters are mono-, di-, tri-, and more particularly of glycerol with long chain carboxylic acids such as C1-C22 carboxylic acid mono, di-, and tri-esters. 优选的材料包括可可脂、棕榈油硬脂、向日葵油、豆油、和椰子油。 Preferred materials include cocoa butter, palm stearin, sunflower oil, soybean oil, and coconut oil. 所述油性或脂肪材料适合以0.05wt%至10wt%、优选0.2wt%至5wt%、更优选约0.5wt%至3wt%的水平存在。 The  Suitable oily or fatty material at 0.05wt% to 10wt%, preferably from 0.2wt% to 5wt%, more preferably is present from about 0.5wt% to 3wt% level. "油"在本说明书中使用时与香料不同，因为香料在Arctander的"天然来源的香料和气味材料（Perfume and Flavor Materials of Natural Origin)" (ISBN-10 :0-931710-36-7)中作为气味（odiferous)材料列出，或在各种数据库包括Flavourbase2010、ES02000(2006更新)和PMP2001中作为气味材料列出。 "Oil" when used in this specification and different spices, as spices Arctander, "Perfume and flavor materials of natural origin (Perfume and Flavor Materials of Natural Origin)" (ISBN-10: 0-931710-36-7) in as an odor (odiferous) materials listed, or various databases including Flavourbase2010, ES02000 (2006 update) and PMP2001 listed as an odor material. 香料通常作为组分的复合混合物的一部分存在，所述混合物中每种气味组分以低于总体组合物的〇. 5wt%的水平存在。 Spices, typically as part of a complex mixture of components present in the mixture of each odor component is present in the overall composition is less than square. 5wt% level. 为了其它目的而存在的油通常以超过总体组合物的〇.5wt%的水平存在。 Present for other purposes than oil typically present in the overall composition of horizontal 〇.5wt%. 本发明的洗衣组合物可以含有非阳离子型软化材料，其优选是油并更优选是油性糖衍生物。  The laundry compositions of the invention may contain a non-cationic softening material, which preferably is an oil and more preferably an oily sugar derivative. 本发明的头发调理剂通常还将掺入脂肪醇。  Hair conditioners of the invention will typically be incorporated fatty alcohols. 在组合物中组合使用脂肪醇和阳离子型表面活性剂被认为特别有利，因为这导致层状相的形成，所述阳离子型表面活性剂分散在所述层状相中。 In combination with the compositions fatty alcohols and cationic surfactants are considered particularly advantageous, because this leads to formation of a lamellar phase, wherein the cationic surfactant is dispersed in the lamellar phase. 代表性的脂肪醇包含8至22个碳原子，更优选16至22个。  Representative fatty alcohols comprise from 8 to 22 carbon atoms, more preferably 16-22. 脂肪醇通常是含有直链烷基的化合物。 Fatty alcohols are typically compounds containing straight chain alkyl groups. 合适的脂肪醇的例子包括鲸蜡醇、硬脂醇、及其混合物。 Examples of suitable fatty alcohols include cetyl alcohol, stearyl alcohol, and mixtures thereof. 在调理剂组合物中使用这些材料也是有利的，因为它们贡献了本发明组合物的全面调理性质。 Use of these materials is also advantageous in conditioning compositions, as their contribution to the overall conditioning properties of compositions of the present invention. 本发明的头发调理剂中的脂肪醇水平通常将在所述组合物的0.01至10重量％、优选〇. 1重量%至8重量％、更优选0.2重量%至7重量％、最优选0.3重量%至6重量%的范围。  Hair conditioners level of fatty alcohol in the present invention in the composition will typically be from 0.01 to 10% by weight, preferably square. 1 wt% to 8 wt%, more preferably from 0.2 wt% to 7 wt%, most % to 6 wt%, the range of preferably 0.3 wt. 阳离子型表面活性剂与脂肪醇的重量比适合地为1:1至1:10,优选1:1.5至1:8,最适合1:2至1:5。 By weight of cationic surfactant to fatty alcohol is suitably from 1: 1 to 1:10, preferably 1: 1.5 to 1: 8, the most suitable for 1: 2 to 1: 5. 如果头发处理组合物中阳离子型表面活性剂与脂肪醇的重量比过高，这可能导致组合物对眼睛的刺激。 If the hair treatment composition by weight of cationic surfactant to fatty alcohol is too high, which may lead to eye irritancy from the composition. 如果它过低，可能使一些消费者感觉头发发涩。 If it is too low, it may cause some consumers feel hair astringent. 脂肪醇可以在洗衣调理剂中作为脂肪络合剂存在，并且优选存在量基于组合物的总重量大于〇. 3至5重量％。  fatty alcohols fatty complexing agent may be present as conditioning agents in the laundry, and is preferably present in an amount based on the total weight of the composition is greater than square. 3 to 5 wt%. 更优选地，所述脂肪组分的存在量是0.4至4%。 More preferably, the fatty component is present in an amount of 0.4 to 4%. 季铵织物软化材料的单酯组分与脂肪络合剂的重量比优选为5:1至1:5,更优选4:1至1:4,最优选3:1至1:3,例如2:1至1:2。 Mono ester component by weight of the fatty complexing agent is a quaternary ammonium fabric softening material is preferably from 5: 1 to 1: 5, more preferably 4: 1 to 1: 4, most preferably 3: 1 to 1: 3, e.g. 2 : 1 to 1: 2. [0221 ]优选本发明的含水组合物还包含悬浮剂和/或粘度增强剂。  The aqueous compositions of the invention preferably further comprises a suspending agent and / or viscosity enhancers. 合适的材料的例子包括:天然胶例如角叉菜胶、黄原胶、阿拉伯胶、黄蓍树胶和瓜尔胶及其衍生物例如羟丙基瓜尔胶和瓜尔胶羟丙基三甲基氯化铵;无机增稠剂例如胶态硅酸错镁(Veegum)，二氧化娃细粉，天然粘土例如膨润土和合成粘土例如可作为Laponite (出自Laporte Industries Ltd)得到的合成锂蒙脱石。 Examples  Suitable materials include: natural gums, for example carrageenan, xanthan gum, gum arabic, gum tragacanth and guar gum and derivatives thereof such as hydroxypropyl guar and guar hydroxypropyl trimethyl ammonium chloride; inorganic thickeners such as colloidal magnesium silicate error (of Veegum), baby dioxide powder, natural clays such as bentonite and synthetic clays such as the laponite (from Laporte Industries Ltd) to give a synthetic hectorite off the stone. 优选的材料选自聚丙烯酸、丙烯酸的交联聚合物、丙烯酸与疏水单体的共聚物、含羧酸单体与丙烯酸酯的共聚物、丙烯酸与丙烯酸酯的交联共聚物、杂多糖胶和结晶长链酰基衍生物。  Preferred materials are selected from polyacrylic acids, cross linked polymers of acrylic acid, copolymers of acrylic acid with a hydrophobic monomer, copolymers of carboxylic acid-containing monomers and acrylic esters, cross-linked copolymers of acrylic acid and acrylate esters, heteropolysaccharide gums and crystalline long chain acyl derivatives. 所述长链酰基衍生物理想地选自乙二醇硬脂酸酯、具有16至22个碳原子的脂肪酸的烷醇酰胺、及其混合物。 The long chain acyl derivative is desirably selected from ethylene glycol stearate, alkanolamides of fatty acids having 16 to 22 carbon atoms, and mixtures thereof. 乙二醇二硬脂酸酯和聚乙二醇3二硬脂酸酯是优选的长链酰基衍生物，因为它们赋予组合物珠光。  Ethylene glycol distearate and polyethylene glycol 3 distearate are preferred long chain acyl derivatives, since these impart pearlescent composition. 聚丙烯酸商业上可作为卡波普(Carbopol)420、卡波普488或卡波普493得到。  Polyacrylic acid is commercially available as Carbopol (Carbopol) 420, Carbopol 488 or Carbopol 493 available. 丙烯酸与多官能剂交联的聚合物也可以使用；它们在商业上可作为卡波普910、卡波普934、卡波普941和卡波普980得到。  acrylic acid polymer crosslinked with a polyfunctional agent may also be used; they are commercially available as Carbopol 910, Carbopol 934, Carbopol 941 and Carbopol 980 obtained. 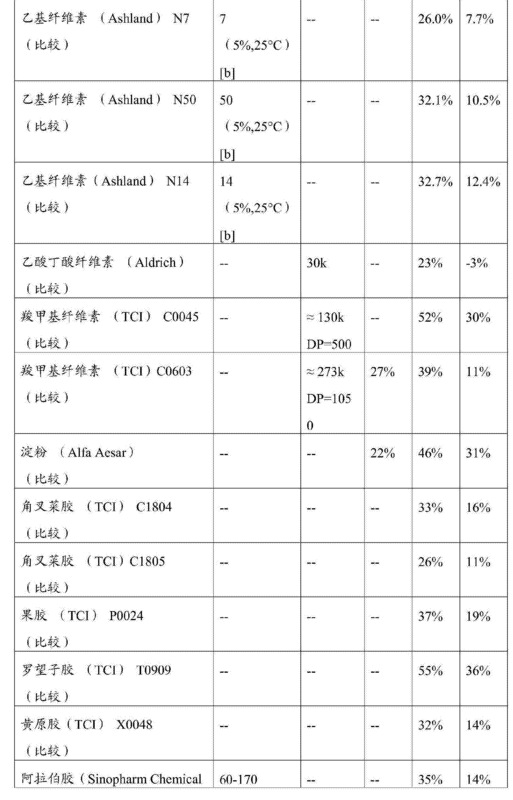 含羧酸的单体与丙烯酸酯的合适共聚物的例子是卡波普1342。 Examples of suitable monomers and copolymers of carboxylic acid-containing acrylic esters is Carbopol 1342. 所有的卡波普(商标)材料均可得自Goodr i ch。 All Carbopol (trademark) materials are available from Goodr i ch. 合适的丙稀酸与丙稀酸酯的交联聚合物是Pemulen TR1或Pemulen TR2。  Suitable acrylic polymers crosslinked with acrylic esters are Pemulen TR1 or Pemulen TR2. 合适的杂多糖胶是黄原胶，例如可作为Kelzan mu得到。 A suitable heteropolysaccharide gum is xanthan gum, for example, available as Kelzan mu. 可以使用任何上述悬浮剂的混合物。  mixtures of any of the above suspending agents may be used. 优选的是丙烯酸的交联聚合物与结晶长链酰基衍生物的混合物。 Preferred is a mixture of acrylic acid crosslinked polymer and a crystalline long chain acyl derivatives. 悬浮剂在本发明的头发处理组合物中存在的水平，基于所述组合物的总重量，以悬浮剂总重量计，通常将为0.1%至10%、优选0.5%至6%、更优选0.9%至4%。  The suspending agent is present in the hair treatment composition of the present invention, the level, based on total weight of the composition to the total weight of the suspension, it will typically be 0.1 to 10%, preferably 0.5% to 6% more preferably from 0.9 to 4%. 本发明的组合物可以含有硅氧烷的乳化液滴。  The compositions of the present invention can contain emulsified droplets of silicone. 在头发处理组合物中，这些产生增强的调理性能。 In hair treatment compositions, which produce an enhanced conditioning performance. 合适的硅氧烷包括聚二有机硅氧烷，特别是CTFA名称为二甲基硅氧烷的聚二甲硅氧烷。  Suitable silicones include polydiorganosiloxanes, in particular the CTFA designation dimethicone polydimethylsiloxane. 同样适合用于本发明组合物(特别是洗发剂和调理剂)的是具有端羟基的聚二甲基硅氧烷，其CTFA名称为二甲基硅氧烷醇。 Also suitable for use compositions of the invention (particularly shampoos and conditioners) are polydimethyl siloxanes having hydroxyl end groups which have the CTFA designation dimethiconol. 适合用于本发明组合物中的还有具有轻度交联的硅橡胶，如例如W096/31188中所述。 Suitable for use in compositions of the present invention there is silicone rubber having a lightly cross-linked, for example as described in W096 / 31188. 所述乳化硅氧烷本身（不是乳液或最终的组合物）的粘度在25°C时通常是至少10， OOOcst，所述硅氧烷本身的粘度优选至少60,000cst，最优选至少500，000cst，理想的是至少1，000，OOOcst。 Viscosity  The emulsified silicone itself (not the emulsion or the final composition) at 25 ° C, usually at least 10, OOOcst, the viscosity of the silicone itself is preferably at least 60,000 cst, most preferably at least 500 , 000cst, desirably at least 1,000, OOOcst. 优选地，所述粘度不超过lOLt，以便于配制。 Preferably the viscosity does not exceed lOLt, to facilitate formulation. 用于本发明组合物中的乳化硅氧烷通常在所述组合物中的平均硅氧烷液滴尺寸将小于30,优选小于20,更优选小于10微米，理想的是0.01至1微米。  A silicone emulsion composition of the present invention usually have an average silicone droplet size in the composition will be less than 30, preferably less than 20, more preferably less than 10 microns, preferably 0.01 to 1 m. 平均硅氧烷液滴尺寸为£ 0.15微米的硅氧烷乳液一般被称为微乳液。 An average silicone droplet size of 0.15 m £ silicone emulsions are generally termed microemulsions. 用于本发明组合物中的乳化硅氧烷通常在所述组合物中的尺寸将小于30,优选小于20,更优选小于15。  The composition used in the present invention emulsified silicone in the composition is generally the size will be less than 30, preferably less than 20, more preferably less than 15. 优选地，所述平均硅氧烷液滴大于0.5微米，更优选大于1微米，理想的是2至8微米。 Preferably, the average silicone droplet greater than 0.5 microns, more preferably greater than 1 micron, preferably 2 to 8 microns. 硅氧烷粒度可以通过激光散射技术、例如使用来自Malvern Instruments的2600D 粒度仪来测量。  silicone particle size by laser light scattering technique, using e.g. 2600D Particle Sizer from Malvern Instruments measured. 合适的预形成的乳液的例子包括Xiameter MEM1785和微乳液DC2-1865,可得自Dow Corning。  Examples of suitable pre-formed emulsions include Xiameter MEM1785 and microemulsions DC2-1865, available from Dow Corning. 这些是二甲基硅氧烷醇的乳液/微乳液。 These are emulsions of dimethiconol / microemulsions. 交联硅橡胶也可以以预乳化的形态得到，其对易于配制是有利的。 Crosslinked silicone rubber can be obtained in a pre-emulsified form, which is advantageous for ease of formulation. 用于包含在本发明组合物、尤其头发处理组合物中的另一种优选的硅氧烷类别是氨基官能的硅氧烷。  for inclusion in the compositions of the present invention, in particular of another preferred hair treatment composition silicones are amino functional siloxanes category. "氨基官能的硅氧烧"是指含有至少一个伯、仲或叔胺基团、或季铵基团的硅氧烷。 By "amino functional silicone burning" refers to a silicone containing at least one primary, secondary or tertiary amine group, or a quaternary ammonium group. 合适的氨基官能硅氧烷的例子包括:CTFA名称为"氨端二甲基硅氧烧"的聚硅氧烷。 Examples of suitable amino functional silicones herein include: CTFA name "amino end dimethyl silicone burn" polysiloxane. 适合用于本发明的氨基官能硅氧烷的具体例子是氨基硅油DC2-8220、DC2_8166和DC2_8566(全部出自Dow Corning)。  Specific examples of suitable amino-functional silicones of the present invention are amino silicone DC2-8220, DC2_8166 and DC2_8566 (all from Dow Corning). 合适的季铵硅氧烷聚合物描述于EP-A-0530974。  Suitable quaternary silicone polymers are described in EP-A-0530974. 优选的季铵硅氧烷聚合物是K3474,出自Goldschmidt。 The preferred quaternary silicone polymer is K3474, from Goldschmidt. 具有非离子和/或阳离子型表面活性剂的氨基官能硅油的乳液也是合适的。  nonionic and / or cationic amino functional silicone emulsions surfactants are also suitable. 氨基官能硅氧烷的预形成乳液也可得自硅油供应商，例如Dow Corning和General Electric。  amino-functional silicone preformed emulsions may also be obtained from suppliers of silicone oils such as Dow Corning and General Electric. 具体的例子包括DC939阳离子乳液和非离子乳液DC2-7224、DC2-8467、DC2-8177 和DC2_8154(全部出自Dow Corning)。 Specific examples include DC939 Cationic Emulsion, and the non-ionic emulsions DC2-7224, DC2-8467, DC2-8177 and DC2_8154 (all from Dow Corning). 硅氧烷的总量优选是总组合物的0.0 lwt%至10wt%，更优选0 . lwt%至5wt%，最优选0.5wt%至3wt%是合适的水平。  The total amount of silicone is preferably 0.0 lwt% to 10wt% of the total composition, more preferably 0. Lwt% to 5wt%, most preferably from 0.5wt% to 3wt% is a suitable level. 阳离子聚合物是本发明的头发处理组合物中用于提高性能的优选成分。  Cationic polymers are preferred ingredients hair treatment composition according to the present invention, for improving performance. 合适的阳离子聚合物可以是均聚物，所述均聚物是阳离子取代的或可以由两种或更多种类型的单体形成。  Suitable cationic polymers may be homopolymers, the homopolymer is a cationically substituted or may be formed from two or more types of monomers. 所述聚合物的重均(Mw)分子量通常将在100000和2百万道尔顿之间。 Weight average of the polymer will typically be between (Mw) molecular weight of 100,000 and 2 million daltons. 所述聚合物将具有阳离子型含氮基团，例如季铵或质子化氨基，或其混合。 The polymers will have cationic nitrogen containing groups such as quaternary ammonium or protonated amino groups, or mixtures thereof. 如果所述聚合物的分子量过低，则调理效果差。 If the molecular weight of the polymer is too low, then the conditioning effect is poor. 如果过高，那么可能有使粘度拉高的问题，导致当倾倒所述组合物时它的拉丝性。 If too high, then there may be problems that the viscosity pulled high, resulting in the composition when it is poured stringiness. 阳离子含氮基团通常将作为取代基存在于所述阳离子聚合物的总单体单元的一部分上。  The cationic nitrogen-containing group will generally total monomer units as the substituent groups present in the cationic polymer part. 因此当所述聚合物不是均聚物时，它可含有非阳离子单体单元的间隔团。 Thus when the polymer is not a homopolymer it can contain spacer non-cationic monomer units in the group. 这样的聚合物描述在第三版的CTFA美容成分目录(CTFA Cosmetic Ingredient Directory)中。 Such polymers are described in the third edition of the CTFA cosmetic ingredients directory (CTFA Cosmetic Ingredient Directory) in. 选择阳离子与非阳离子单体单元的比率，以产生阳离子电荷密度在要求范围内、通常从0.2至3.0meq/gm的聚合物。 Selecting the ratio of the cationic to non-cationic monomer units, to generate a cationic charge density in the required range, usually a polymer of from 0.2 to 3.0meq / gm of. 所述聚合物的阳离子电荷密度适合通过如美国药典所述的凯氏法(Kjeldahl method)，在测定氮的化学试验下测定。 The cationic charge density of the polymer as described in US Pharmacopoeia adapted by Kjeldahl method (Kjeldahl method), measurement of nitrogen measured at the test chemical. 合适的阳离子聚合物包括例如具有阳离子胺或季铵官能团的乙烯基单体与水溶性间隔单体例如（甲基)丙烯酰胺、烷基和二烷基（甲基)丙烯酰胺、（甲基)丙烯酸烷基酯、乙烯基己内酯和乙烯基吡咯烷的共聚物。  Suitable cationic polymers include, for example vinyl monomers with water soluble spacer monomers having cationic amine or quaternary ammonium functionality such as (meth) acrylamides, alkyl and dialkyl (meth) acrylamide, ( meth) acrylic acid alkyl ester, vinyl caprolactone and vinyl pyrrolidine. 烷基和二烷基取代的单体优选具有C1-C7烷基，更优选C1-3烷基。 The alkyl and dialkyl substituted monomers preferably have C1-C7 alkyl, more preferably C1-3 alkyl groups. 其他合适的间隔团包括乙烯基酯、乙烯醇、马来酸酐、丙二醇和乙二醇。 Other suitable spacer groups include vinyl esters, vinyl alcohol, maleic anhydride, propylene glycol and ethylene glycol. 取决于所述组合物的具体物质和pH，所述阳离子胺可以是伯、仲或叔胺。  depending upon the particular species and the pH of the composition, the cationic amines can be primary, secondary or tertiary amines. 一般优选仲和叔胺，特别是叔胺。 Preferably general secondary and tertiary amines, in particular tertiary amines. 胺取代的乙烯基单体和胺可以聚合成胺的形式，然后通过季铵化而转化为铵。  Amine substituted vinyl monomers and amines can be polymerized in the form of an amine, then converted to ammonium by quaternization. 所述阳离子聚合物可以包含来源于胺-和/或季铵-取代的单体和/或相容的间隔单体的单体单元的混合物。  The cationic polymers can comprise an amine derived from a - a mixture and / or monomeric units compatible spacer monomers substituted monomer - and / or quaternary ammonium. -阳离子型聚丙烯酰胺(如W095/22311所述）。  - cationic polyacrylamides (as described in W095 / 22311). 其他可以使用的阳离子聚合物包括阳离子多糖聚合物，例如阳离子纤维素衍生物、阳离子淀粉衍生物和阳离子瓜尔胶衍生物。  Other cationic polymers that can be used include cationic polysaccharide polymers, such as cationic cellulose derivatives, cationic starch derivatives, and cationic guar derivatives. 其他合适的阳离子多糖聚合物包括含季氮的纤维素醚(例如，如美国专利3，962， 418所述），和醚化纤维素与淀粉的共聚物(例如，如美国专利3，958，581所述）。  Other suitable cationic polysaccharide polymers include cellulose ethers (e.g., such as 3,962, 418 the U.S. Patent), and etherified copolymers of cellulose and starch (e.g., as described in US Patent No. 3 quaternary nitrogen-containing the 958,581). 可以使用任何上述阳离子聚合物的混合物。  Any mixture of the above cationic polymers may be used. 阳离子聚合物在本发明的洗发剂组合物中存在的水平，基于所述组合物的总重量，以所述阳离子聚合物的总重量计，通常为〇. 01至5%、优选0.05至1%、更优选0.08至0.5%。  cationic polymer is present in the shampoo composition of the present invention, the level, based on total weight of the composition, based on the total weight of the cationic polymer, typically a square 01 to 5%, preferably 0.05 to 1%, more preferably from 0.08 to 0.5%. 按总组合物的重量计，用于本发明的洗衣组合物中的聚合物的量适合从0.001至0 · 5wt%，优选0· 005至0· 4wt%，更优选0· 05至0 · 35wt%并最优选0 · 1至0 · 25wt%。  by weight of the total composition, the amount of polymer used in the laundry compositions of the present invention are suitable of from 0.001 to 0 · 5wt%, preferably 0 · 005 to 0 · 4wt%, more preferably 0 to 0.05 0 · 35wt% and most preferably. 1 to 0 · 0 · 25wt%. 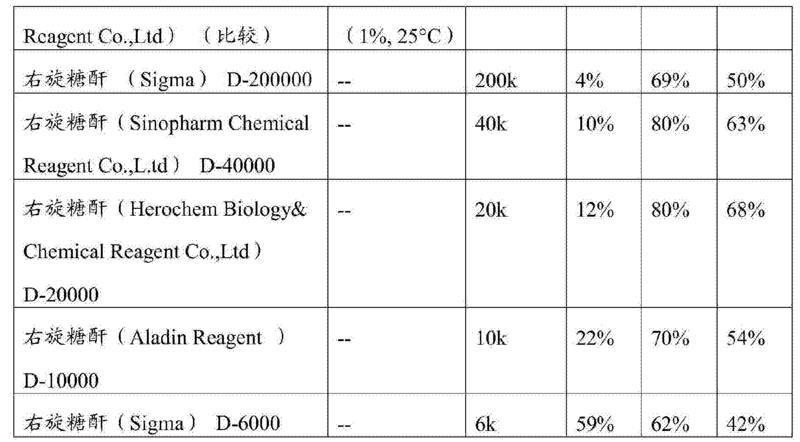 优选的聚合物的例子是出自SNF的Flosoft270LS。 Examples of preferred polymers is from SNF of Flosoft270LS. 作为包含在本发明组合物中的其它任选组分，可以提到已知用于美容组合物的以下常规添加材料:乳化剂，保湿剂，悬浮剂，流变调节剂，珠光剂，乳浊剂，盐，香料，缓冲剂， 着色剂，润肤剂，增湿剂，泡沫稳定剂，防晒材料，抗微生物剂，防腐剂，抗氧化剂，以及天然油和提取物。  Examples of other optional components included in the compositions of the present invention, the following may be mentioned conventionally known additive for cosmetic compositions: emulsifiers, humectants, suspending agents, rheology modifiers, pearlescent agents , opacifiers, salts, perfumes, buffering agents, colorants, emollients, moisturizers, foam stabilizers, sunscreen materials, antimicrobial agents, preservatives, antioxidants, and natural oils and extracts. 这些的一部分或全部都可以存在于组合物的主体中，以及一部分作为有益剂存在于有益剂递送颗粒中。 Body part or all of these may be present in the composition, as well as a portion of the beneficial agent present in the benefit agent delivery particles. 任选的遮蔽染料可用于本发明的头发和洗衣组合物中。  The shading dye may be used optionally hair and laundry compositions of the present invention. 优选的染料呈现紫色或蓝色。 Preferred dyes are violet or blue presentation. 遮蔽染料可以执行与基体发黄相关的各种功能。 Shading dyes may perform various functions associated with the yellow base. 例如，在洗衣组合物中，任何不饱和季铵化合物遭受一定程度的UV光和/或过渡金属离子催化的自由基自氧化，伴随有织物发黄风险，而遮蔽染料降低了因这种缘由的发黄风险。 For example, in a laundry composition, any unsaturated quaternary ammonium compounds suffer from some degree of UV light and / or transition metal ion catalysed radical auto-oxidation, accompanied by the risk of yellowing of fabric, while the shading dye is reduced due to such a reason yellow risk. 不同的遮蔽染料产生不同的着色水平。  Different shading produce different levels of coloring dyes. 因此，存在于本发明的组合物中的遮蔽染料水平取决于遮蔽染料的类型。 Thus, present in the composition of the present invention depends on the level of shading shading dyes of the type of dye. 按总组合物的重量计，适合于本发明的优选的总体范围是0 · 00001 至0 · 1 wt%，更优选0 · 0001 至0 · 01 wt%，最优选0 · 0005 至0 · 005wt%。 By weight of the total composition, suitable for the present invention preferably is generally in the range of 0 · 00001 to 0 · 1 wt%, more preferably from 0 · 0001 to 0 · 01 wt%, most preferably from 0 · 0005 to 0 · 005wt% . 为了可以进一步理解本发明并进行实践，将参考以下实施例进一步描述。  For a further understanding of the invention and may be practiced, the following will be further described with reference to embodiments. 在实施例中，如同在说明书的其余部分中，所有百分比都按重量计，除非另作说明。 In an embodiment, as in the rest of the description, all percentages are by weight, unless otherwise specified. 1-乙基-3-(3-二甲基氨基丙基)碳二亚胺盐酸盐(EDAC)从Alfa Aesor得到，所有其它化学物质从Sinopharm Chemical Reagent Co.，Ltd.得到。  1-ethyl-3- (3-dimethylaminopropyl) carbodiimide hydrochloride (EDAC) obtained from Alfa Aesor, all other chemicals. Available from Sinopharm Chemical Reagent Co., Ltd.
 羧基官能化的聚苯乙烯颗粒通过分散共聚而合成。  carboxy-functionalized polystyrene particles synthesized by the dispersion copolymerization. 500mL三颈烧瓶装入140mL乙醇和12. OmL含有38.0g苯乙烯、1.4g丙烯酸和3.0g聚(N-乙烯基吡咯烷)的DI水。 500mL three-neck flask charged with 140mL of ethanol and 12. OmL 38.0g of styrene, 1.4g DI water, 3.0g of acrylic acid and poly (N- vinyl pyrrolidine) containing. 保持氮气保护和500rpm的搅拌速率。 Nitrogen and kept under stirring rate of 500rpm. 该溶液通过用氮气鼓泡1.0小时除氧。 The solution was bubbled with nitrogen for 1.0 hours by oxygen. 充分脱氧之后，将温度上升到70°C并向该溶液添加6.0g AIBN。 After sufficient deoxygenation, the temperature was raised to 70 ° C and to this solution was added 6.0g AIBN. 反应在70°C保持20小时。 The reaction at 70 ° C for 20 hours. 冷却到室温之后，将胶乳以lOOOOrpm离心15分钟并倾去上清液。 After cooling to room temperature, the latex lOOOOrpm centrifuged for 15 min and the supernatant decanted. 胶乳颗粒在100mL乙醇中再分散，以lOOOOrpm离心15分钟并倾去上清液。 Latex particles re-dispersed in 100mL of ethanol, centrifuged for 15 min at lOOOOrpm and the supernatant decanted. 所述胶乳然后在乙醇中再分散并再次离心，倾去上清液并收集羧基官能聚酯颗粒。 The latex is then dispersed in ethanol and centrifuged again, the supernatant was poured off and collected carboxyl functional polyester particles. 所述羧基官能聚酯颗粒(3.6μπι)通过以下程序纯化。  The carboxyl functional polyester particles (3.6μπι) was purified by the following procedure. 步骤1:1. 〇mL胶乳用0.5mL ρΗ7.01缓冲液稀释并以lOOOOrpm离心15分钟。  Step 1: 1 〇mL latex was diluted with 0.5mL ρΗ7.01 buffer and centrifuged for 15 min at lOOOOrpm. 重复用PH7的缓冲液洗涤一次。 The wash buffer was repeated once PH7. 步骤2:倾掉上清液并且所述胶乳在DI水中再分散。  Step 2: The supernatant was poured off and the latex was re-dispersed in DI water. 所述溶液以lOOOOrpm再次离心15分钟并倾去上清液。 The solution was centrifuged for 15 min at lOOOOrpm again and the supernatant decanted. 重复用去离子水洗涤一次。 Washed with deionized water was repeated once. EDAC偶联的直接化学偶联用于将多糖接枝到PS颗粒上。  EDAC coupling for direct chemical coupling of polysaccharides grafted onto PS particles. 上述纯化的胶乳在500mL DI水中再分散，固体含量为5.5%(¥/¥)。  The latex was further purified dispersed in 500mL DI water to a solids content of 5.5% (¥ / ¥). 25!1^去离子水和0.28g EDAC添加到4.57mL上述纯化的胶乳中（5.5%固体含量），所产生的混合物在25°C搅拌3小时。 25! ^ 1 of deionized water and 0.28g EDAC was added to the above purification 4.57mL latex (solids content 5.5%), the resulting mixture was stirred at 25 ° C 3 hours. 然后所述胶乳以lOOOrpm离心10分钟，并用pH7的缓冲液和去离子水按照实施例10b 中说明的步骤1和2进行纯化。 The latex is then lOOOrpm step centrifuged for 10 minutes, and washed with deionized water and buffer pH7 according to Example 10b described embodiments 1 and 2 were purified. 然后所述胶乳在20mL去离子水中再分散。 The latex is then re-dispersed in 20mL of deionized water. 没有添加任何多糖的比较(对照)样品按照实施例la中说明的同样程序制备。  Preparation of Comparative any polysaccharide (control) samples in accordance with Example la in the same procedure as described was not added. 胶乳的最终固体含量调节到1 .〇%(w/w)。 The final solids content of the latex was adjusted to 1 .〇% (w / w). 用十二烷基苯磺酸钠(LAS)和Synperonic A7作为表面活性剂储液，使用恒温振荡设备（THZ型平台，由Shanghai Jing Hong laboratory instrument Co.，Ltd.供应），评价聚苯乙烯胶乳(3.6μπι，有或者没有多糖)的递送。  a sodium dodecylbenzene sulfonate (LAS) and Synperonic A7 as a surfactant reservoir, using a constant temperature shaking apparatus (THZ mesa by Shanghai Jing Hong laboratory instrument Co., Ltd. Supply), poly Evaluation styrene latex (3.6μπι, with or without polysaccharide) delivery. 表面活性剂储液通过将LAS(5.0g)和Synperonic A7(5.0g)溶解在去离子水中到总共1 · 0升而制备。  Surfactant reservoir by the LAS (5.0g) and Synperonic A7 (5.0g) was dissolved in deionized water to a total of 1. 0 l was prepared. 最终溶液的表面活性剂浓度是1 〇g/L(50%LAS，50%Synper〇nic A7)。 The surfactant concentration in the final solution was 1 〇g / L (50% LAS, 50% Synper〇nic A7). 碱缓冲储液通过在去离子水中溶解碳酸钠(7.546g)和碳酸氢钠(2.419g)到总共1.0升而制备。 Base buffer stock solution was prepared by dissolving sodium carbonate (7.546g) and sodium bicarbonate (2.419g) in deionized water to a total of 1.0 liters. 所述碱缓冲液浓度是〇. 1M。 The buffer concentration is square base. 1M. 利用恒温振荡设备模拟洗涤程序用于沉积性能评价。  using a constant temperature shaking apparatus for depositing a washing program simulation performance evaluation. 典型的程序描述如下。 A typical procedure is described below. 55mL含有600ppm具有或者没有接枝多糖的聚苯乙烯胶乳（3.6μπι)的模拟洗涤液(1. Og/L表面活性剂和0.01M碱缓冲液)在120mL瓶子中制备，并取出5 . OmL等份试样用于记录400nm处吸光度。  55mL containing 600ppm or having polystyrene latex (3.6μπι) is not grafted polysaccharide analog washing liquid (1. Og / L of surfactant and alkaline buffer 0.01M) was prepared in 120mL bottles and remove 5 . OML aliquot for recording absorbance at 400nm. 该吸光度值表示在洗瓶过程之前，100%颗粒在洗涤溶液中。 The absorbance value represents the washing process prior to 100% of the particles in the wash solution. 然后将一片（20x20cm)无荧光的针织聚酯（5. Og左右）或三片（10x10cm)无荧光的棉织物（总共4.5g左右)放入瓶子中并密封瓶子。  Then a (20x20cm) knitted polyester non-fluorescent (about 5. Og) or three (10x10cm) non-fluorescent cotton fabric (a total of about 4.5g) put into the bottle and the bottle sealed. 将振荡器浴加热到40°C，并将所述瓶子夹入其中，以125rpm振摇30分钟，以模拟主洗涤。 The oscillator bath was heated to 40 ° C, and the bottle is sandwiched therein to 125rpm shaking for 30 minutes to simulate the main wash. 然后取出所述织物并用手拧，取出10.OmL等份试样的主洗涤溶液用于记录400nm处的吸光度。 The fabric was then removed and hand-tighten and remove the main wash 10.OmL aliquot sample of the solution for absorbance was recorded at 400nm. 织物上吸附的聚苯乙烯胶乳量可以通过主洗涤阶段之前/之后的混浊度差来确定。 Polystyrene latex adsorption capacity of the fabric may be determined by the difference between the haze before the main wash stage / after. 然后彻底洗涤所述瓶子。  The bottle was then thoroughly washed. 拧过的织物放回到瓶中并添加50mL DI水。 Threaded through the fabric and returned to the flask was added 50mL DI water. 所述瓶子在40 °C下以125rpm振荡10分钟以模拟漂洗程序。 The bottle at 40 ° C under shaking at 125rpm for 10 minutes to simulate a rinse procedure. 然后取出织物并再次用手拧。 Then the fabric was removed and tighten again. 取出10.OmL等份试样的漂洗溶液用于记录400nm处的吸光度。 Remove rinsed 10.OmL aliquot was recorded for absorbance at 400nm. 在漂洗1阶段吸附的聚苯乙烯胶乳从织物的损失量可以根据混浊度确定。 Adsorbed polystyrene latex rinsing phase may be determined from the amount of loss of fabrics according haze. 漂洗程序重复一次，可以测定在漂洗2阶段聚苯乙烯胶乳从织物中的损失量。 Rinsing procedure was repeated once, the fabric can be determined from the amount of loss in the rinsing 2 stage of polystyrene latex. [a]多糖与PS颗粒的进给比是0 · 6:1。  [a] PS feed ratio of polysaccharide particles is 0.6: 1. [b]溶剂是80%甲苯和20%乙醇。  [b] Solvent 80% toluene and 20% ethanol. 对于所有其它粘度数据而言，溶剂是水。 For all other data in terms of viscosity, solvent is water. 下表显示了实施例1和2的一些合并结果，其中沉积百分率在聚酯和棉二者漂洗之后记录。  The following table shows some of the combined results of Examples 1 and 2, wherein the percentage recorded after deposition of both the polyester and cotton rinsing. 能够看出，本发明的颗粒(使用右旋糖酐的那些）显示在聚酯和棉二者上出色的沉积，但比较例(使用HEC)在棉上产生良好的沉积但在聚酯上不能产生良好的沉积。 As can be seen, the particles of the invention (those using dextran) show excellent deposited on both cotton and polyester, but the Comparative Example (using HEC) produce good deposit on cotton but not on a polyester produced good deposition. 预形成的三聚氰胺甲醛香料包封物的尺寸是15微米并从Givaudan Limited得到。  Size of a melamine formaldehyde pre-formed perfume encapsulates are 15 microns and available from Givaudan Limited. 分别地，所述颗粒固体是41.6wt%并且香料固体是28.Owt%。 Separately, the particulate solid is 41.6wt% perfume and solids 28.Owt%. 右旋糖酐由Aldrich提供（目录编号31398)。 Dextran is provided by Aldrich (Cat. No. 31398). 向100ml锥形烧瓶中添加19 · 5g福尔马林(37wt%甲醛水溶液)和44 · Og水。  19 · 5g added formalin (37wt% aqueous solution of formaldehyde) and 44 · Og water to 100ml conical flask. 所述溶液的pH利用0.3g的5wt%碳酸钠水溶液调节到8.9。 The pH of the solution using 0.3g of 5wt% aqueous sodium carbonate solution was adjusted to 8.9. 添加10g三聚氰胺和0.64g氯化钠并在室温下搅拌所述混合物10分钟。 Add 0.64g of sodium chloride and 10g of melamine and the mixture is stirred for 10 minutes at room temperature. 所述混合物被加热到65°C并搅拌直到它变得澄清。 The mixture was heated to 65 ° C and stirred until it became clear. 这种混合物以下称为"预聚合物（1)"。 This mixture is hereinafter referred to as "pre-polymer (1)." 在定轨振荡器(VWR Standard5000振荡器，设置为数字4)上将l.Og的右旋糖酐在99.0g去离子水中振荡过夜进行溶解，来制备lwt%的右旋糖酐溶液。  (4 VWR Standard5000 oscillator, a digital set) will be dissolved l.Og of dextran in 99.0g of deionized water was shaken overnight in an orbital shaker, to prepare lwt% dextran solution. 50g这种右旋糖酐溶液转移到装有顶置式搅拌器和冷凝器的250ml圆底烧瓶中。 50g of this solution was transferred to dextran 250ml round bottom equipped with an overhead stirrer and a condenser flask. 添加23.6g的三聚氰胺甲醛包封物衆液(41.6wt%颗粒固体)并将所述混合物在搅拌下加热到75°C。 Adding melamine formaldehyde encapsulates all of the fluid 23.6g (41.6wt% particulate solid) was added and the mixture was heated to 75 ° C under stirring. 添加0.9g新鲜制备的预聚合物（1)溶液，并利用大约2g的10wt%甲酸水溶液将pH调节到4.1。 Add 0.9g freshly prepared prepolymer (1) was added, and the pH was adjusted to 4.1 using approximately 2g of 10wt% aqueous formic acid. 然后让所述混合物在75°C 搅拌2小时。 The mixture was then allowed to stir at 75 ° C 2 hours. 然后冷却所述溶液并利用大约6g的5wt%碳酸钠水溶液调节到pH7。 The solution was then cooled and adjusted to about pH7 using 6g of 5wt% aqueous sodium carbonate solution. 得到最终的分散体(大约100g )，其包含1 Owt%包封物固体，所述包封物固体含有附加的2wt%三聚氰胺甲醛壳和5wt%(基于最终颗粒重量)的右旋糖酐。  The final dispersion obtained (about 100g), containing 1 Owt% solids encapsulation, said encapsulate comprising an additional solid melamine formaldehyde shell and 2wt% 5wt% (based on the final weight of the particles) of dextran. 向去离子水添加12%活性剂SLES、1.6%活性剂CATO和1%活性剂氯化钠，制备模拟洗发剂制剂。  Deionized water was added to 12% of the active agent SLES, 1.6% and 1% of the active agent CATO active agent sodium chloride, was prepared simulated shampoo formulation. 由此，制备包含具有或者没有接枝多糖的1 %活性剂MF包封物的制剂。 Thus, a formulation comprising polysaccharide grafted with or without 1% of the active agent MF encapsulant. 通过添加乳酸〇.38%、Lexamine S_131.25%，Genamin BTLF0.87%，Lanette S35%， Nipagin MO. 2%，制备模拟调理剂制剂。  〇.38% by addition of lactic acid, Lexamine S_131.25%, Genamin BTLF0.87%, Lanette S35%, Nipagin MO. 2%, an analog conditioner formulations were prepared. 由此，制备包含具有或者没有接枝右旋糖酐的1%活性剂MF包封物的制剂。 Thus, a formulation comprising a graft with or without 1% of the active agent dextran MF encapsulant. 长2"、称重0.3g的深褐色欧洲人发束(DBE)起初在14%SLES溶液中碱洗。然后使用洗发剂或调理剂制剂的标准洗涤方案。测试发束根部和末梢。  Size 2 ", weighing 0.3g dark brown European hair tresses (DBE) in 14% SLES first caustic solution is then washed using standard shampoo or conditioner formulations scheme test tress and roots tip. 洗发剂处理:利用水龙头的35-40摄氏度水流，流速每分钟3-4升，彻底润湿发束并抖去多余水。  The shampoo treatment: 35-40 ° C using tap water, the flow rate of 3-4 liters per minute, thoroughly wet tress and shake off excess water. 沿着每个发束的长度涂敷O.lg洗发剂/g头发，并通过在手之间揉搓30秒加以搅拌。  O.lg shampoo is applied along the length of each hair bundle / g of hair, and 30 seconds with stirring by rubbing between the hands. 然后用温流水冲洗发束30秒。 Then tress with warm running water for 30 seconds. 抖去多余水并让发束干燥。 Shake off excess water and let the tresses dry. 调理剂处理:利用水龙头的35-40摄氏度水流，流速每分钟3-4升，彻底润湿发束并抖去多余水。  Conditioning treatment: 35-40 ° C using tap water, the flow rate of 3-4 liters per minute, thoroughly wet tress and shake off excess water. 沿着每个发束的长度涂敷0.2g调理剂/g头发，并通过在手之间揉搓1分钟进行搅拌。  is applied along the length of each tress 0.2g conditioner / g hair by rubbing between the hands for 1 minute with stirring. 然后用温流水冲洗发束1分钟。 Then tress with warm running water for 1 minute. 抖去多余水并让发束干燥。 Shake off excess water and let the tresses dry. 每种处理洗涤五个重复发束以用于再现性。  Five replicates of each treatment were washed tress for reproducibility. 当干燥时，每个发束放入玻璃小瓶并添加2ml乙醇以提取任何沉积物。  When dry, each tress into glass vials and 2ml of ethanol was added to extract any deposits. 所述小瓶滚动2小时。 Rolling the vial for 2 hours. 从每个小瓶取100ul等分试样并放入96-孔板中。 100ul aliquots taken from each vial and placed into 96-well plates. 然后在高通量Thermo Varioskan Flash荧光分光计上测量板的荧光。 Then high throughput fluorescence spectrometer Thermo Varioskan Flash fluorescence measurements on the plate. 通过比较相对于浓度进行校准的荧光和完全沉积的预期荧光，可以确定MF包封物的沉积效率。 Fluorescence and fluorescence fully expected deposited calibrated by comparing the relative concentrations, deposition efficiency may be determined MF encapsulant. 结果显示，香料包封物表面连接右旋糖酐提高了从洗发剂和调理剂制剂二者向头发的递送。  The results show that perfume encapsulates dextran surface of the connection from the improved delivery of both shampoos and conditioners to hair formulations. 1. 有益剂递送颗粒，在所述颗粒的外表面具有一种或多种含有右旋糖酐的递送助剂， 所述颗粒进一步包含水不溶性非多糖聚合物，所述水不溶性非多糖聚合物是氨基塑料聚合物，其中所述颗粒包含核和至少一层壳，所述核包含所述有益剂并且所述至少一层壳包含所述水不溶性非多糖聚合物，所述右旋糖酐连接在最外层壳的外表面处。 1. The benefit agent delivery particle, having one outer surface of the particle delivery aid comprising one or more of dextran, a water-insoluble particle further comprises a non-polysaccharide polymer, the water insoluble polymer is a non-polysaccharide aminoplast polymer, wherein the particle comprises a core and at least one shell, the core comprising a benefit agent and at least one shell comprises an insoluble polymer of the non-aqueous polysaccharide, dextran connected to said outermost shell outer surface. 2. 根据权利要求1的颗粒，其中所述右旋糖酐的分子量大于5kD。 2. The particles according to claim 1, wherein the dextran molecular weight greater than 5kD. 3. 根据权利要求2的颗粒，其中所述右旋糖酐的分子量大于20kD。 3. The particles according to claim 2, wherein the dextran molecular weight greater than 20kD. 4. 根据权利要求1-3任一项的颗粒，所述颗粒包含香料。 4. Particles according to any one of claims 1 to 3, said particles comprising perfume. 5. 根据权利要求1的颗粒，其中所述核包含所述有益剂的微滴或包含其中吸附了所述有益剂的聚合物基质。 A particle according to claim 1, wherein the core comprises a benefit agent comprising droplets or adsorbed polymer matrix wherein the benefit agent. 6. 组合物，其包含： a) 根据权利要求1-5任一项的颗粒，和b) 酶，所述酶选自木质酶、透明质酸酶、软骨素酶、漆酶、糖基水解酶、或其混合物。 6. A composition, comprising: a) particles according to any one of claims 1-5, and b) an enzyme selected from wood, hyaluronidase, chondroitinase, laccase, a glycosyl hydrolase enzymes, or mixtures thereof. 7. 组合物，其包含： a) 根据权利要求1-5任一项的颗粒，和b) 酶、所述酶选自半纤维素酶、纤维素酶、果胶酶、戊聚糖酶、淀粉酶、或其混合物。 7. A composition, comprising: a) particles according to any one of claims 1-5 claim, and b) an enzyme selected from hemicellulase, cellulase, pectinase, pentosanase, amylases, or mixtures thereof. 8. 组合物，其包含： a) 根据权利要求1-5任一项的颗粒，和b) 酶，其选自支链淀粉酶、多聚半乳糖醛酸酶、木聚糖酶、甘露聚糖酶、果胶酸裂解酶、 阿拉伯糖苷酶、或其混合物。 8. A composition, comprising: a) granules according to claim any one of claims 1-5, and b) an enzyme selected from pullulanases, poly-galacturonic acid enzyme, xylanase, mannan carbohydrases, pectate lyase, arabinosidases or mixtures thereof. 9. 洗衣处理组合物，其包含： a) 根据权利要求1-5任一项的颗粒， b) 至少一种阴离子表面活性剂或非离子表面活性剂，和c) 选自纤维素酶、甘露聚糖酶和其混合物的酶。 9. A laundry treatment composition comprising: a) particles according to any one of claims 1-5, b) at least one anionic surfactant or nonionic surfactant, and c) is selected from a cellulase, mannanase xylanase enzymes and mixtures thereof. 10. 根据权利要求9的洗衣处理组合物，其中所述组合物是液体或凝胶。 10. A laundry treatment composition according to claim 9, wherein said composition is a liquid or a gel. 11. 头发处理组合物，其包含： a) 根据权利要求1-5任一项的颗粒， b) 至少一种阴离子表面活性剂或非离子表面活性剂。 11. A hair treatment composition, comprising: a) particles according to any one of claims 1-5, b) at least one anionic surfactant or nonionic surfactant. 12. 用于生产根据权利要求1-5任一项的有益剂递送颗粒的方法，其中： a) 使用乳液聚合包封芳香油以形成核-壳颗粒，和b) 在右旋糖酐存在下，在所述核-壳颗粒的外表面上形成进一步的聚合物层。 12. A method for producing according to any of claims 1-5 of a benefit agent delivery particle, wherein: a) the use of encapsulated fragrance oil emulsion to form a core - shell particles, and b) in the presence of dextran in the forming a further polymer layer on the outer surface of the shell particle - said core. DE3764460D1 (en) 1986-05-21 1990-09-27 Novo Industri As Preparation of a granulate containing an enzyme and its use in detergents. ES2225960T3 (en) 1997-03-15 2005-03-16 THE PROCTER &amp; GAMBLE COMPANY Delivery system. ES2358178T3 (en) 2011-05-06 liberating particle containing a beneficial agent. EP0601035A1 (en) 1994-06-15 Liquid fabric softener with protected cyclodextrine/perfume complex.